The Museum of Modern Art, New York, is currently displaying a number of works by Robin and Lucienne Day from their permanent collection as part of the exhibition The Value of Good Design. The exhibition includes Lucienne Day’s Spectators (1953) and Mezzanine (1958) textile designs and a rare surviving example of the original Lounge Chairs designed by Robin Day for the opening of London’s Royal Festival Hall in 1951. 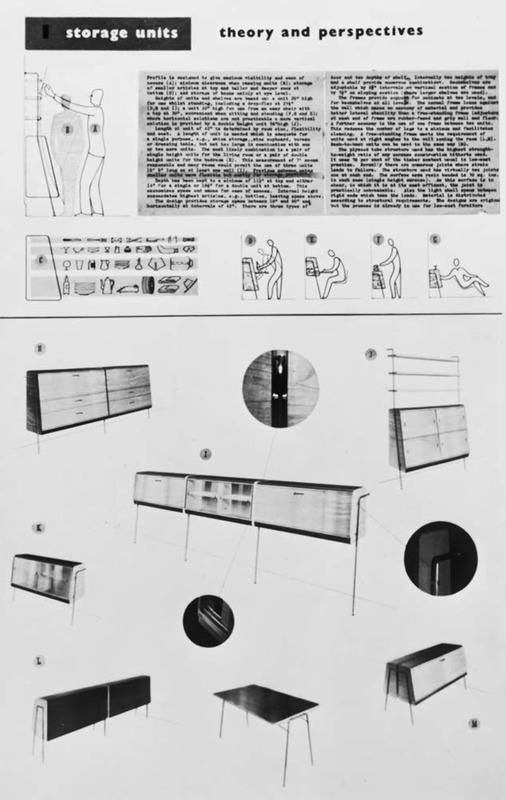 Also exhibited are the display panels prepared by Robin Day and Clive Latimer for their prize-winning submission to the storage section of the 1948MoMA International Low-Cost Furniture Design Competition. The 1948 competition was one of the Good Design initiatives undertaken by MoMA from the late 1930s to 1950s. 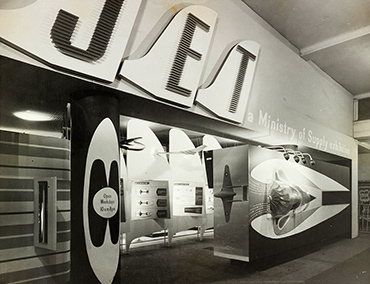 The current exhibition explores the democratising potential of design, looking at the Good Design phenomenon in an international context, with government agencies across the world embracing it as a vital tool of social and economic reconstruction and technological advancement in the wake of World War II. The exhibition is organized by Juliet Kinchin, Curator, and Andrew Gardner, Curatorial Assistant, Department of Architecture and Design. It will run till 15th June 2019. A new book celebrating forty years of the Sir Misha Black Medal and Awards has just been published. 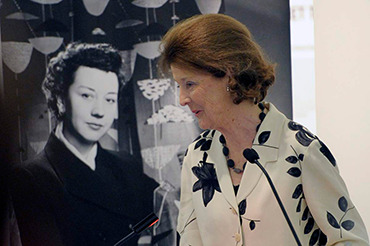 From 1993 to 2007 Lucienne Day served as representative of the Faculty of Royal Designers for Industry on the committee of the Sir Misha Black Awards, the world’s only major awards recognising and promoting excellence in design education. Fitness for What Purpose? 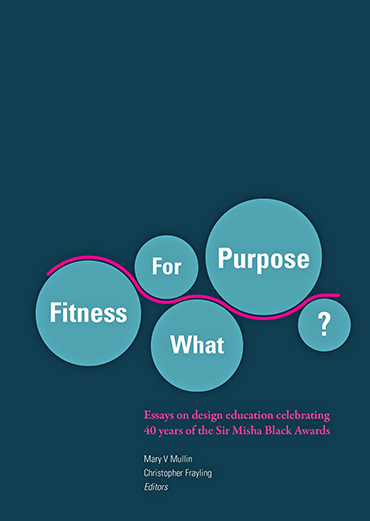 is edited by our Patron Professor Sir Christopher Frayling and our Trustee Mary Mullin, Chairman of the Sir Misha Black Awards Committee. The book offers a collection of thoughtful essays by some of the world’s leading design educators. 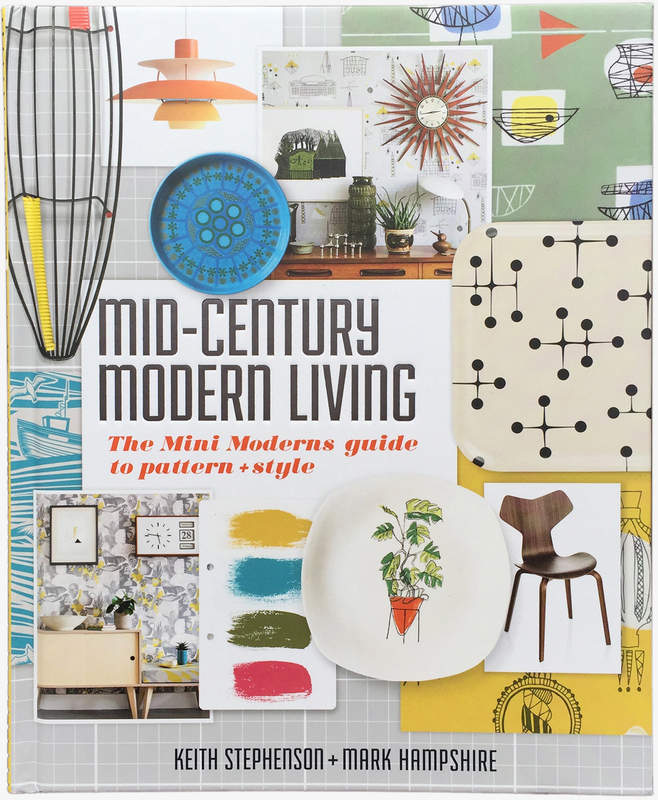 Robin and Lucienne Day designs feature throughout this new book by Keith Stephenson and Mark Hampshire of interiors brand Mini Moderns. 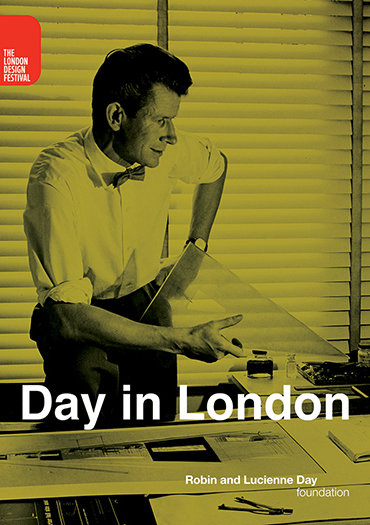 The book includes historic photographs of Robin and Lucienne Day designs from our digital archive and images of current reissues produced by our licensees. 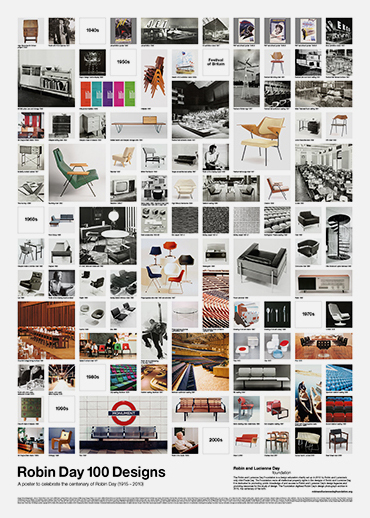 Special ‘20th Century Design Icon’ pages are devoted to Robin Day and Lucienne Day. Mid-Century Modern Living is published by Kyle Books and was launched at Southbank Centre shop, London on 28 March. 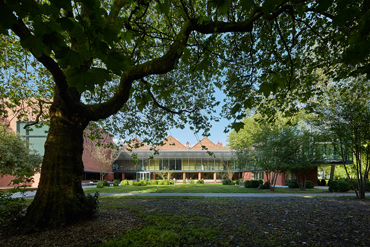 Robin and Lucienne Day moved to Chichester in 1999 where they often visited Pallant House Gallery with its fine modern extension and one of the country’s most important collections of 20th century British Art. 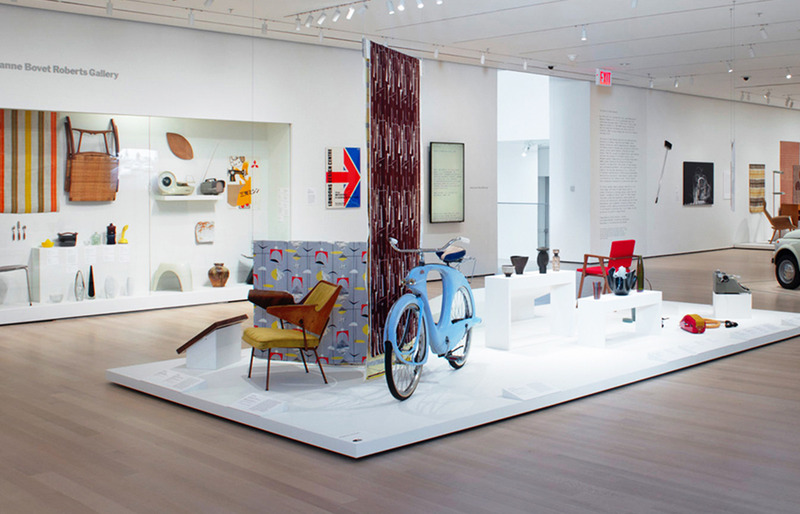 In 2011 the Gallery hosted the posthumous exhibition Robin and Lucienne Day: Design and the Modern Interior. 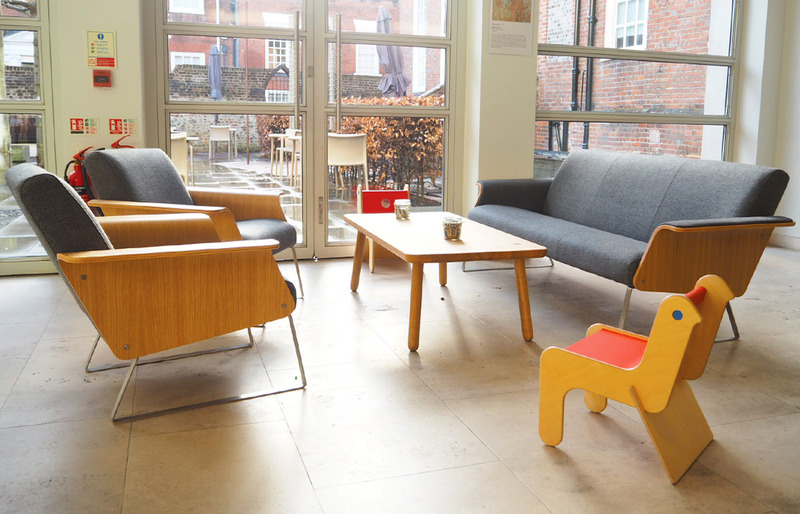 Fittingly, Pallant House Gallery has now furnished all the ground floor spaces with Robin Day designs. His 675 Chair (1952) and West Street Chair (2006), both produced by Case Furniture, provide seating in the restaurant. The café /foyer areas have recently been refurnished with further Robin Day designs including the plywood Avian Sofa and Childsply Chair, which he created for London design company twentytwentyone at the turn of the century. 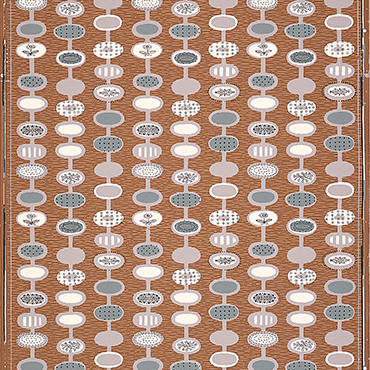 We are continuing to work on our Lucienne Daysilk mosaics digital catalogue. Our Curator Wilhelmina Bunn has compiled meticulous listings of all information available tous to date. 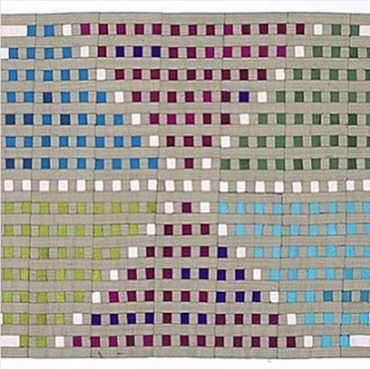 We now know that between the mid-1970s and the end of the century Lucienne Day designed at least 180 silk mosaics. Many of these were displayed and sold at nearly 30 exhibitions worldwide. In response to the call-out we mounted in association with V&A Museum, London, a number of owners have contacted us with news and images of their silk mosaics. This photograph of Lucienne Day’s ‘Sagittarius' (one of the Twelve Signs of the Zodiac series) was taken with the kind permission of Consuelo Gonzalez. 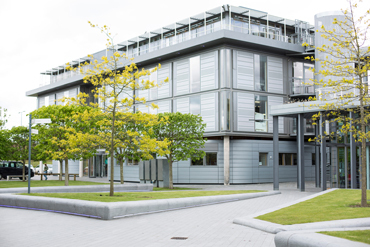 We are planning to appoint a part-time Business Assistant. 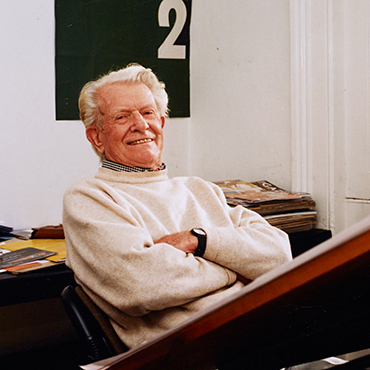 The role will involve working alongside the Chair to develop the Foundation’s design licensing business in line with the organisation’s commercial objectives and its Policies for endorsement of new productions of Robin and Lucienne Day’s designs. The appointee will be responsible for a range of general commercial and administrative tasks and will support the Chair in negotiations with new licensing partners, management of product development and product promotion. Applications are invited from individuals with a business background in the design industry. We post regularly on Twitter @robin_lucienne and Instagram @robinlucienneday. 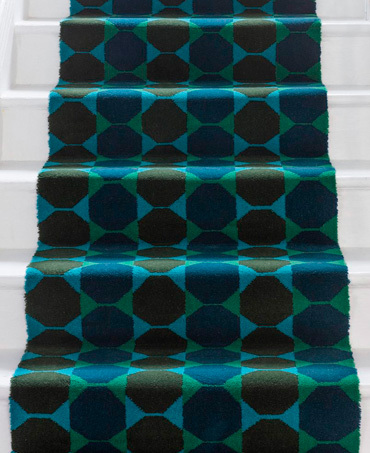 More than fifty years after she created them, Lucienne Day’s 1964 carpet designs Octagon and Squares and Diamonds have won Homes and Antiques Rug Design of the Year Award 2018. 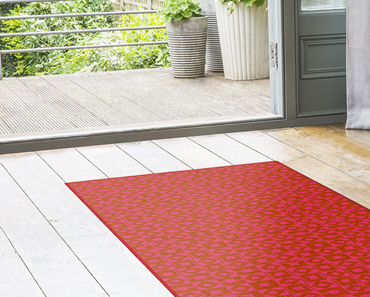 Innovative carpet company Alternative Flooring launched the Authentic Lucienne collection of carpet runners and rugs earlier this year. These high-quality reissues are woven in the Wilton Carpets factory in Wiltshire where they were originally produced in the 1960s. 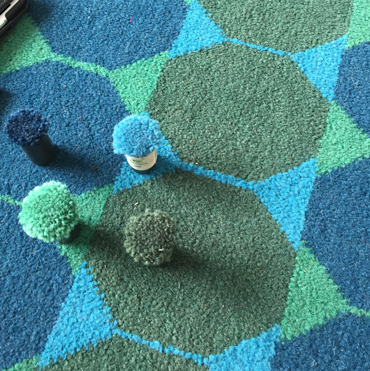 The Rug Design of the Year Award is one of the annual awards established by Campaign for Wool, a charity which promotes the natural benefits of wool. We are delighted to announce the appointment of Wilhelmina Bunn as Curator to the Robin and Lucienne Day Foundation. Wilhelmina has organised digital collections and curated exhibitions at the Royal College of Art, the BBC and The Design Council. 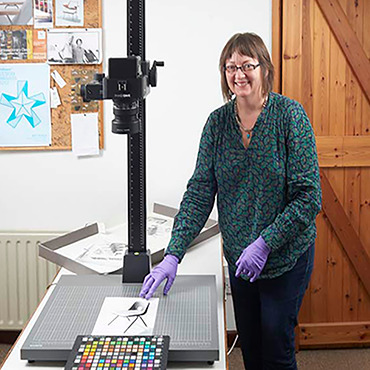 Since 2014 she has worked with us to develop and manage our Robin and Lucienne Day digital archive, creating the database, arranging photoshoots and accessioning over 8,000 images. This year she has sourced and collated information about Lucienne Day’s silk mosaics to build a comprehensive catalogue. As Curator Wilhelmina's role will expand to include handling press image requests and liaising with archivists and exhibition curators at our partner organisations. Our Trustee Mary Mullin spoke at the opening of the Arts University Bournemouth touring exhibition Lucienne Day: Living Design at the F.E. McWilliam Gallery, Banbridge, Northern Ireland on 26th September. The exhibition, which formed part of Linen Biennale Northern Ireland, included Lucienne Day Irish Linen tea towels reissued by twentytwentyone and a Robin Day 675 Chair made by Case Furniture with heritage linen-mix upholstery fabric woven by Northern Ireland company Mourne Textiles. Mary Mullin also spoke at the Linen Biennale conference in Lisburn on 3rd October. In a brilliant address on the subject of Longevity of Design she explored the characteristics of enduring design from Irish prehistory to the works of Robin and Lucienne Day. 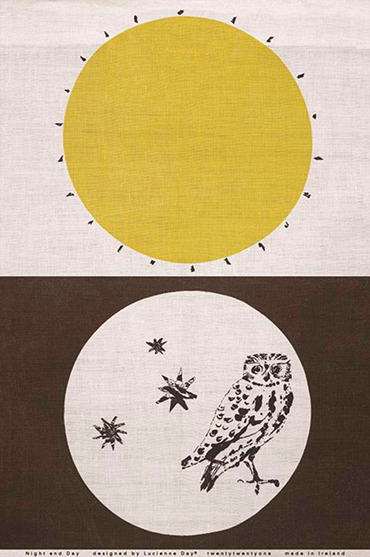 Lucienne Day’s classic tea towel design Night and Day (c.1962), reissued by London design company twentytwentyone, has been selected by the prestigious Design Store of the Museum of Modern Art, New York. ‘The buying team for MoMA Design Store embraces the same spirit of modernism upon which the Museum's architecture and design department— first of its kind anywhere in the world—was founded. Our selection starts with designers and manufacturers that were integral to the establishment of modern design, and whose iconic designs remain relevant today’. (MoMA Store website). 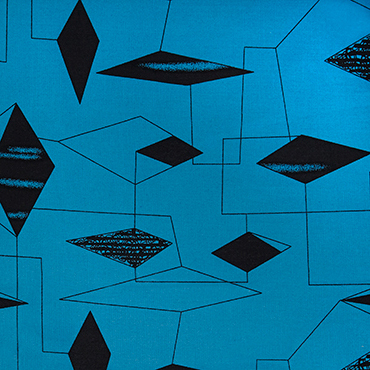 Four Lucienne Day textiles are held in the permanent collections of the MoMA Department of Architecture and Design. 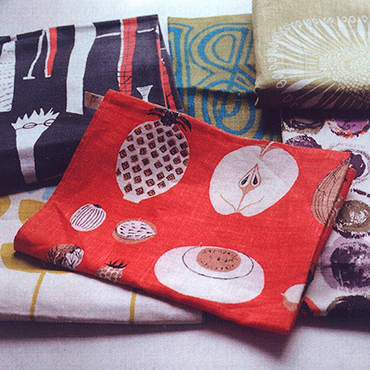 Thirteen of Lucienne Day’s designs feature in a new book about the history of tea towel design by Marnie Fogg. 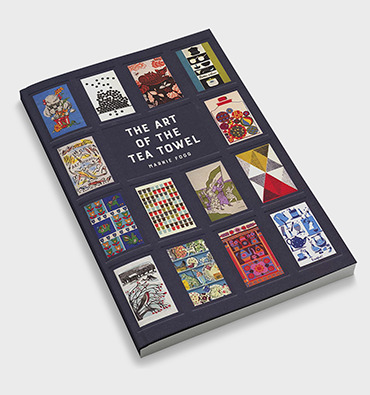 We supplied the publisher with archive images of historic tea towels produced between 1959 and 1969 by Belfast-based Irish linen company Thomas Somerset and its successor Nova Products. The book also includes images of the four Lucienne Day tea towel reissues currently produced by London design company twentytwentyone. 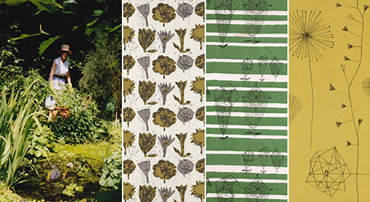 Lucienne Day’s wallpaper designs Provence (1951) and C-Stripe (1954) feature in a new publication by Zoe Hendon. The book traces the history of wallpaper from the 17th century to the late 20th century, examining how social mobility and new technologies have influenced design trends. Zoe Hendon is Head of Museum Collections at the Museum of Domestic Design and Architecture (MoDA), Middlesex University, which holds one of the country’s most important collections of historic wallpapers. The Arts University Bournemouth touring exhibition Lucienne Day: Living Design will open at the F.E. McWilliam Gallery, Banbridge, Northern Ireland on 26th September. This is the seventh venue for this acclaimed touring exhibition, which opened at The Gallery, AUB in January 2017 as part of our Lucienne Day centenary celebrations. The F.E. McWilliam Gallery is dedicated to the memory of sculptor Frederick Edward McWilliam, one of Ireland’s most influential and successful artists, who was born in Banbridge in 1909. 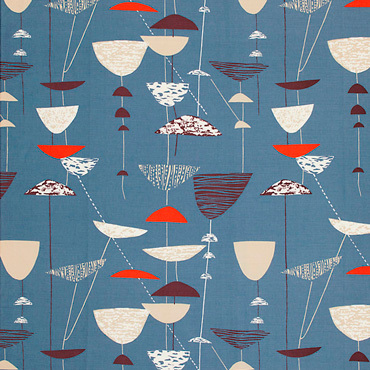 Lucienne Day: Living Design will be showing there till 10th November. Our Trustee Mary Mullin will speak on Longevity of Design at the Linen Biennale conference taking place in Lisburn on 3rd and 4th October. Linen Biennale Northern Ireland celebrates the past, present and future landscape of linen through an extended arts festival, presented and hosted by multiple venues across the region. 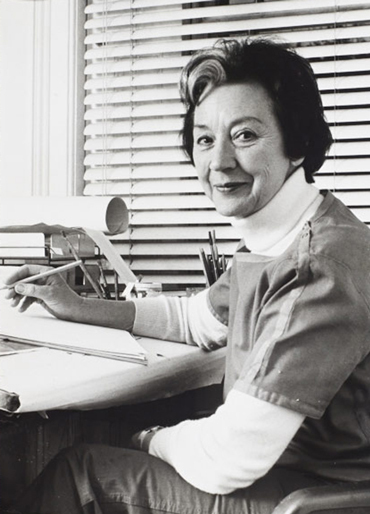 In the late 1950s and 1960s Lucienne Day designed table linen and tea towels for Belfast-based Irish Linen company Thomas Somerset, whose director Ron Crawford believed that design was the key to reviving the fortunes of the declining Irish linen industry. 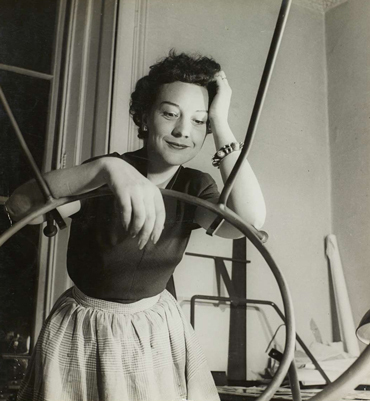 Lucienne Day’s innovative designs were marketed by London-based subsidiary Fragonard. The exhibition Lucienne Day: Living Design includes Lucienne Day tea towels reissued under licence by London design company twentytwentyone. 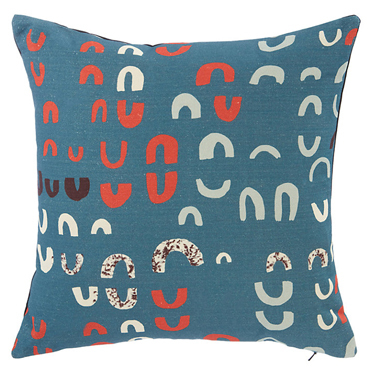 Like the originals, they are printed in Ireland on 100% Irish Linen. 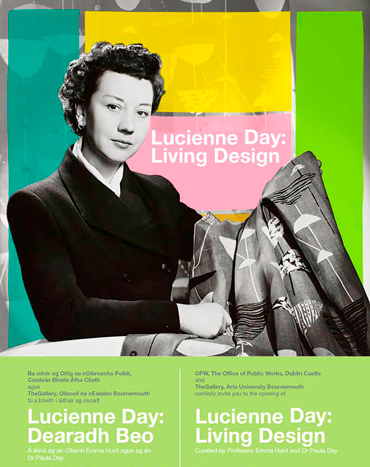 Lucienne Day: Living Design launched at Coach House Gallery, Dublin Castle on 19th July. Our Trustee Mary Mullin and exhibition curator Professor Emma Hunt spoke and the event was attended by Professor Stuart Bartholomew CBE, Vice-Chancellor of Arts University Bournemouth. The exhibition was widely acclaimed in the Irish national press. The Irish Times hosted a Women’s Podcast interview with Emma Hunt and Mary Mullin while on 9th August RTE Radio 1 programme Arena broadcast an interview with Paula Day. A major Lucienne Day silk mosaic from the Plan of Peking series is on display in the exhibition The Most Real Thing which opened on 15th September at New Art Centre, Roche Court, Wiltshire. New Art Centre is a renowned gallery and sculpture park. The Most Real Thing brings together diverse artists and makers to examine the relationship between contemporary sculpture and textiles. 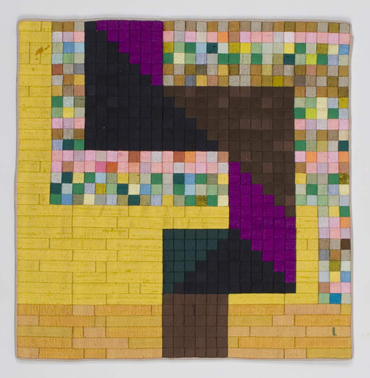 The title of the exhibition is taken from Anni Albers’ writings: ‘we must come down to earth from the clouds where we live in vagueness and experience the most real thing there is: material’. The exhibition is open till 4th November. 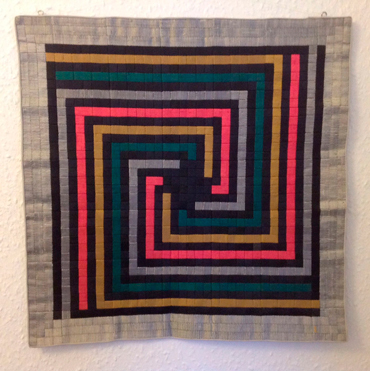 Lucienne Day’s silk mosaic Golden Tangram, which we donated to the Whitworth Art Gallery, Manchester in 2014, has been the subject of a student project at the Centre for Textile Conservation, Glasgow University. Second year student Kim Tourret carried out an investigation into a treatment methodology for Golden Tangram, which bears a mark possibly caused by adhesive. 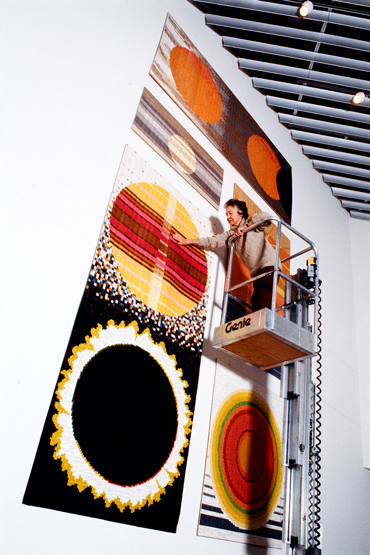 We provided information about the design, construction and history of the piece in the context of Lucienne Day’s overall silk mosaic practise. 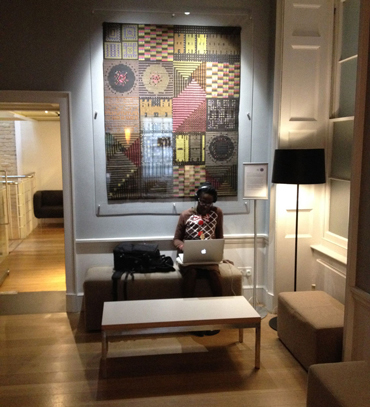 This summer we ran a student placement at the Foundation’s office. 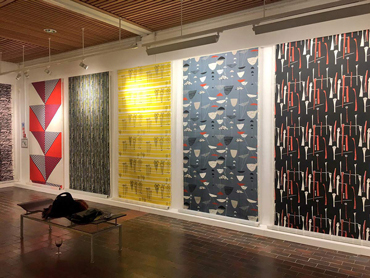 Loughborough University Textile Design and Innovation BA second-year student Sarah Hampson assisted with cataloguing and conserving our collection of Lucienne Day silk mosaics and licensed reissues of Lucienne Day textile designs. Lucienne Day carpet designs feature on the Alternative Flooring stand at Decorex International 2018, held at Syon Park, London on 16th – 19th September. 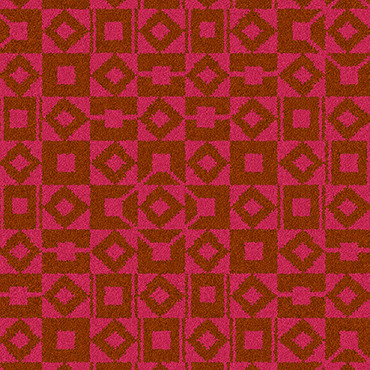 We have collaborated with Alternative Flooring on the 'Authentic Lucienne' collection, a reissue of 1964 Lucienne Day carpet designs meticulously developed from samples held in the Whitworth Art Gallery. 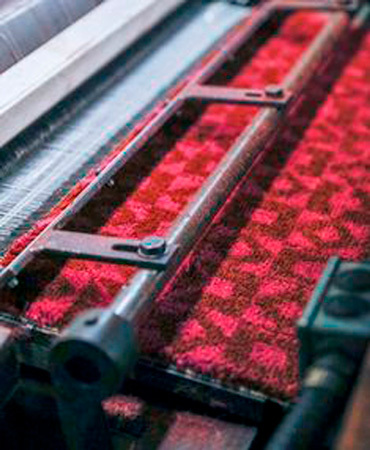 The new carpet runners are woven in the Wilton Carpets factory where the original carpets were produced. Decorex International showcases the best of international interior design. 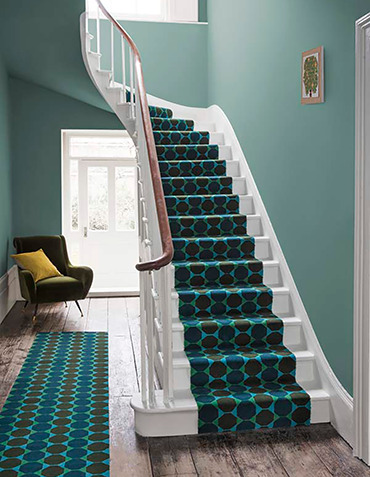 London design retailer twentytwentyone now stocks the new 'Authentic Lucienne' carpet runners launched earlier this year by Alternative Flooring. Lucienne Day's Octagon in her original sea-green colourway and Squares and Diamonds in her original pink/orange are available from twentytwentyone in 1 metre and 1.6 metre lengths. 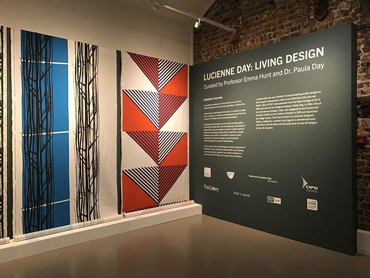 The Arts University Bournemouth touring exhibition Lucienne Day: Living Design will open at Coach House Gallery, Dublin Castle, Republic of Ireland on 20th July. The exhibition will be launched by Mary Mullin, Trustee of the Robin and Lucienne Day Foundation and Honorary Fellow of Arts University Bournemouth. Dating from 1204, Dublin Castle is one of the architectural highlights of Dublin. The exhibition will run at Coach House Gallery till 15th September 2018. This is the first international showing of this acclaimed exhibition, which opened at The Gallery, AUB in January 2017 and has toured to four other UK venues. 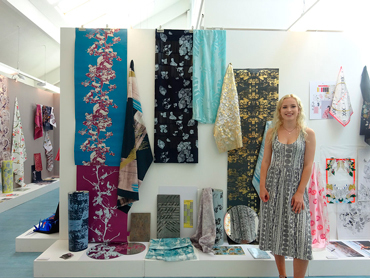 In celebration of our close relationship with Arts University Bournemouth, we have established an annual Textiles Prize for an AUB Textiles graduate. This year’s winner was Lilli Rochford-Smith. The standard of work was so high that the Judges decided to divide the bursary between winner Lilli Rochford-Smith, runner-up Alice Blayden and commended graduates Rosie Heron and Annabel Criddle. Alice Blayden said: ‘I was overwhelmed by pride upon my nomination for the Prize. 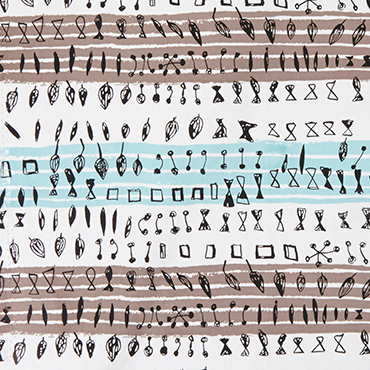 Lucienne Day’s textiles have been an inspiration to me through university’. The prizes were presented at the Arts University Bournemouth graduation ceremony on 29th June by Principal and Vice-Chancellor Professor Stuart Bartholomew CBE. 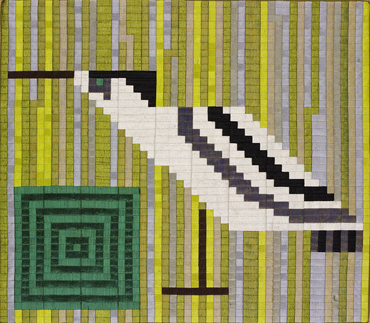 We are currently compiling a comprehensive catalogue of Lucienne Day's silk mosaics. Our archivist Wilhelmina Baldwin has so far collected and collated documentation and images of over one hundred and twenty silk mosaic designs and is developing a digital resource to catalogue this material. 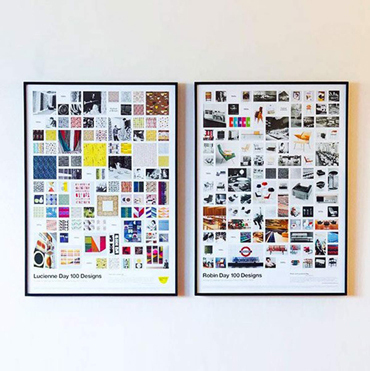 Sources include publications and Lucienne Day's personal exhibition sales lists, as well as images and information supplied by the public in response to the social media call-out we mounted last year in partnership with V&A Museum, London. We would be delighted to receive further images and information relating to Lucienne Day's silk mosaics. This image of her silk mosaic Whirligig 1 was kindly supplied by Margaret Hall. Following the success of the Centenary Limited Edition launched by London design retailer twentytwentyone at their Day for Flowers exhibition last year, a further edition has been manufactured by Stoke-based ceramics company 1882 Ltd and is available from twentytwentyone. 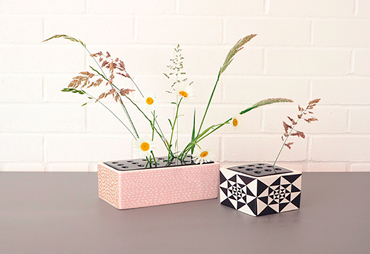 Lucienne Day’s flower bricks are a contemporary take on the 18th century Delftware genre of rectangular ceramic containers for flower arrangements. The reissue is available in a choice of two sizes and two patterns. 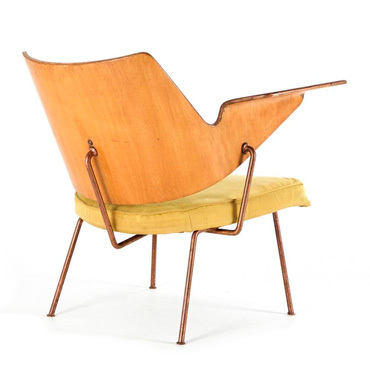 The Museum of Modern Art, New York has acquired one of the few surviving examples of the original moulded plywood Lounge Chairs designed by Robin Day for the opening of the Royal Festival Hall, London in 1951. 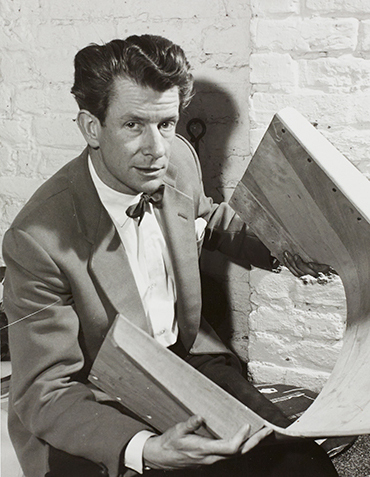 In 1948 Robin Day in partnership with Clive Latimer won First Prize in the storage section of the Museum of Modern Art International Low-Cost Furniture Competition. 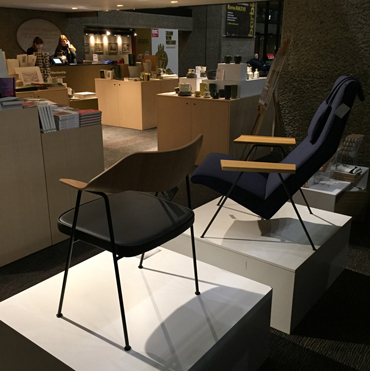 The acquisition of the RFH Lounge Chair by the MoMA Department of Architecture and Design marks a renewed recognition of the Museum’s historic links with Robin Day. Lucienne Day’s most famous textile design Calyx is now available from John Lewis, Britain’s largest department store chain. 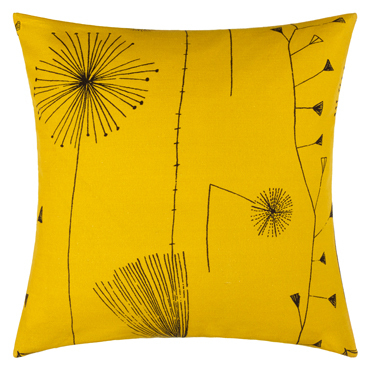 John Lewis now carries a substantial Lucienne Day range. 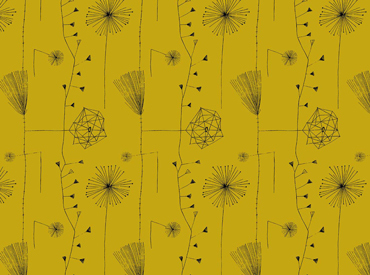 The Calyx and Dandelion Clocks linen/cotton mix curtain fabrics are rotary-printed for our licensee Classic Textiles at Stead McAlpin, the Carlisle company which printed many of Lucienne Day’s textiles in the 1950s. John Lewis offers a made-to-measure curtains service. Six cushion designs are also available. These are made up by Lancashire company Herbert Parkinson from a heavier-weight linen/cotton mix fabric digitally printed by Classic Textiles. The range is available to order online and is stocked at selected branches of John Lewis. 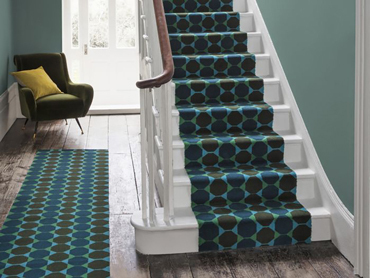 Innovative carpet company Alternative Flooring has launched an ‘Authentic Lucienne’ range of original 1964 Lucienne Day carpet designs in her own vibrant colourways. 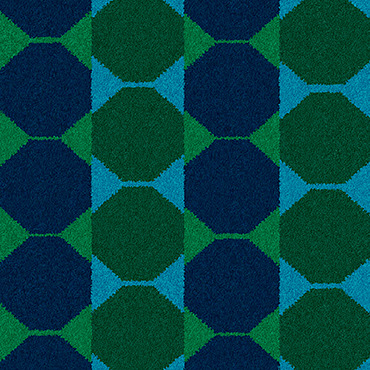 Octagon in sea-green and Squares and Diamonds in fuchsia are available as runners or rugs and may be ordered online from Alternative Flooring. The full range will launch later this year. The Arts University Bournemouth touring exhibition Lucienne Day: Living Design was shown at Oxfordshire Museum, Woodstock from 13th January to 4th March this year. 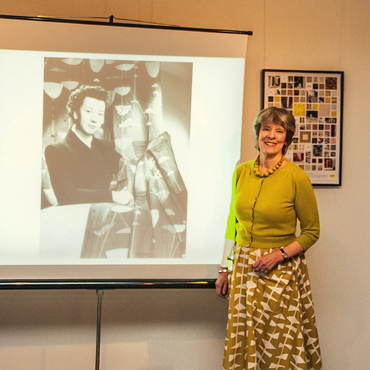 On 3rd February Jennifer Harris, former Deputy Director and Textiles Curator at the Whitworth Art Gallery, Manchester and recipient of our award for ‘Lifetime Contribution to Lucienne Day Studies’ gave a talk to a capacity audience at the Museum. 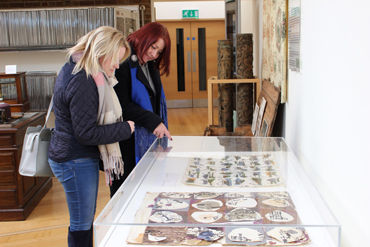 The Arts University Bournemouth touring exhibition opened at New Brewery Arts, Cirencester, Gloucestershire on 17th March, where it is providing the inspiration for a series of textiles workshops and other events. Details may be found on the New Brewery Arts website. Lucienne Day: Living Design celebrates the continuing vitality of Lucienne Day’s design legacy in a sequence of photographs from our digital archive and a display of Classic Textiles’ digital reprints of twelve of her historic designs. Later this year the exhibition will tour to the Coach House Gallery, Dublin Castle, Republic of Ireland and the FE McWilliam Gallery, Banbridge, County Down, Northern Ireland. 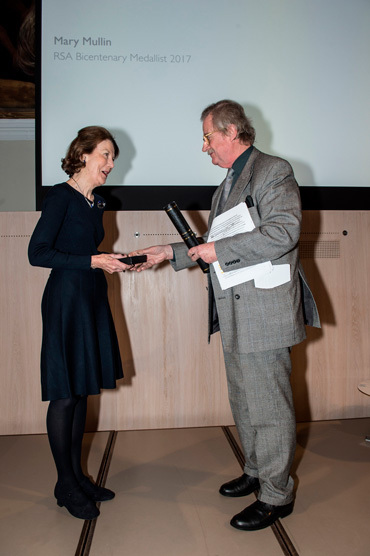 Our Trustee Mary Mullin has been awarded the Royal Society of Arts Bicentenary Medal in recognition of her 'advocacy, encouragement and promotion of design to benefit society across education and industry'. The Medal was presented by Professor Sir Christopher Frayling at a ceremony held at RSA House, London on 30th November 2017. Mary Mullin is Chairman of the Sir Misha Black Awards for Distinguished Services to Design Education, an organisation based at the Royal College of Art, London, which has a global focus on influential design teaching. As a Trustee of the Robin and Lucienne Day Foundation from its inception in 2012, Mary has made an outstanding contribution to our work, particularly in the area of student Awards and other educational initiatives. We have updated our website to include new Licensees, new Lives & Designs images and new Subscribe and Contact pages. We are delighted to announce our new collaboration with The Alternative Flooring Company Ltd, sister company to Wilton Carpets, to bring Lucienne Day's 1964 carpet designs for Wilton Royal back into production. 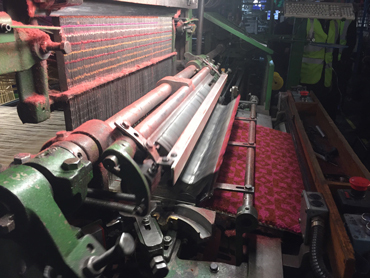 As a fitting climax to the centenary year, on December 1st Paula Day and national press witnessed the historic moment when a new production of Lucienne Day's design 'Squares and Diamonds' rolled off an original1960s loom at the Wilton Carpets factory in Wilton, Wiltshire, where it had first been manufactured. 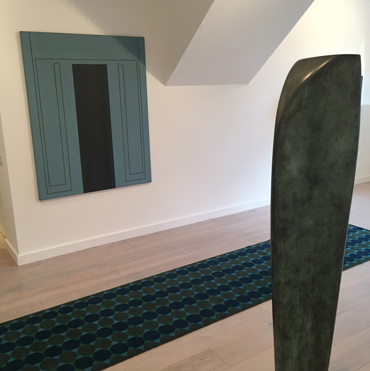 The party then visited the Artist's House at New Art Centre, Salisbury, to view a runner of Lucienne Day's design 'Octagon' on display alongside a Barbara Hepworth sculpture and Robyn Denny paintings of the same era. We have worked closely with Alternative Flooring in a meticulous process of product development and colour matching, using design artwork discovered in the archives of Wilton Carpets and original carpet samples held at the Whitworth Art Gallery, Manchester. The full 'Authentic Lucienne' range will launch in 2018. 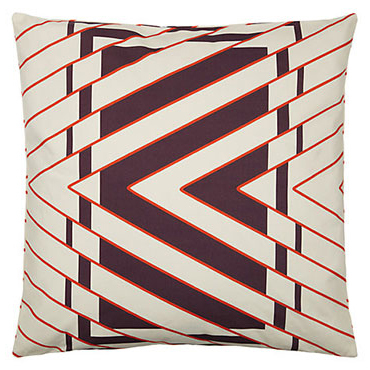 Following the success of the Lucienne Day Centenary cushions collection, a new fabrics range is launching at John Lewis. Dandelion Clocks and Calyx in blue are available by the metre in a lightweight linen/cotton mix, especially suitable for curtaining. The fabrics are stocked at selected branches of John Lewis and a made-to-measure curtain service is available. 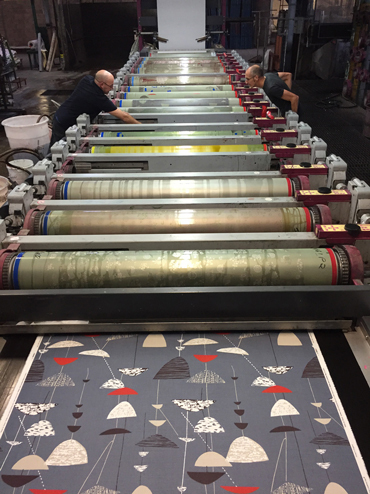 Rotary-printed for our licensee Classic Textiles at the Stead McAlpin factory in Carlisle, where many of Lucienne Day's 1950s designs were originally printed, this new range celebrates a great tradition of British design and manufacturing. 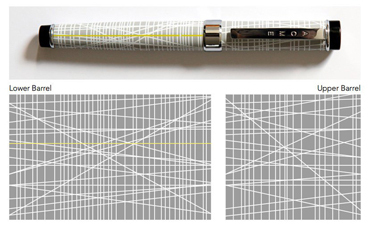 Salts Mill design retailer The Home has launched a limited-edition Lucienne Day centenary celebration pen, designed by Ruth Hudson-Silver and produced by Acme. The pen is available to order online or may be purchased at The Home, where the owners’ fine collection of Lucienne Day ceramics will remain on display over the Christmas period. On September 7th Paula Day presented an illustrated talk to an enthusiastic and knowledgeable capacity audience at the Fashion and Textile Museum, London. She focused on her mother’s little-known designs for dress fabrics and her personal fashion style, before going on to describe highlights of the Lucienne Day centenary year. The Arts University Bournemouth touring exhibition Lucienne Day: Living Design opened at Manchester School of Art in October as part of Design Manchester. Classic Textiles’ digital reprints of Lucienne Day’s historic designs were hung on the tall walls of the Vertical Gallery, Benzie Building. A panel discussion chaired by exhibition curator Emma Hunt with panel members Jennifer Harris and Paula Day took place on October 18th and was attended by a lively audience of design professionals and students. The Arts University Bournemouth exhibition Lucienne Day: Living Design will continue to tour throughout 2018, opening at The Oxfordshire Museum, Woodstock on January 13th. Other venues confirmed so far include New Brewery Arts, Cirencester, Gloucestershire and FE McWilliam Gallery, Banbridge, Co.Down. 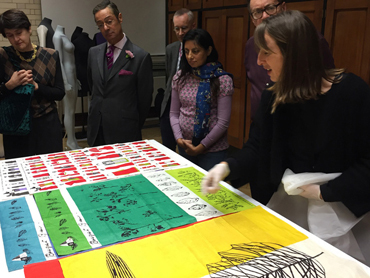 On December 5th a Lucienne Day evening was held for the Director's Circle of the Victoria and Albert Museum at the textile archives in Clothworkers' Centre, Blythe House, London. Paula Day presented an illustrated talk about her mother's life and work. Archivist Christopher Marsden and Textile Curator Victoria Bradley then introduced a display of Lucienne Day's original artwork and textiles. The V&A Museum holds the world's largest Lucienne Day collection, including her paper archives. The V&A website currently carries a Lucienne Day Online Collection, with articles about her industrial design career and her later work in silk mosaics. 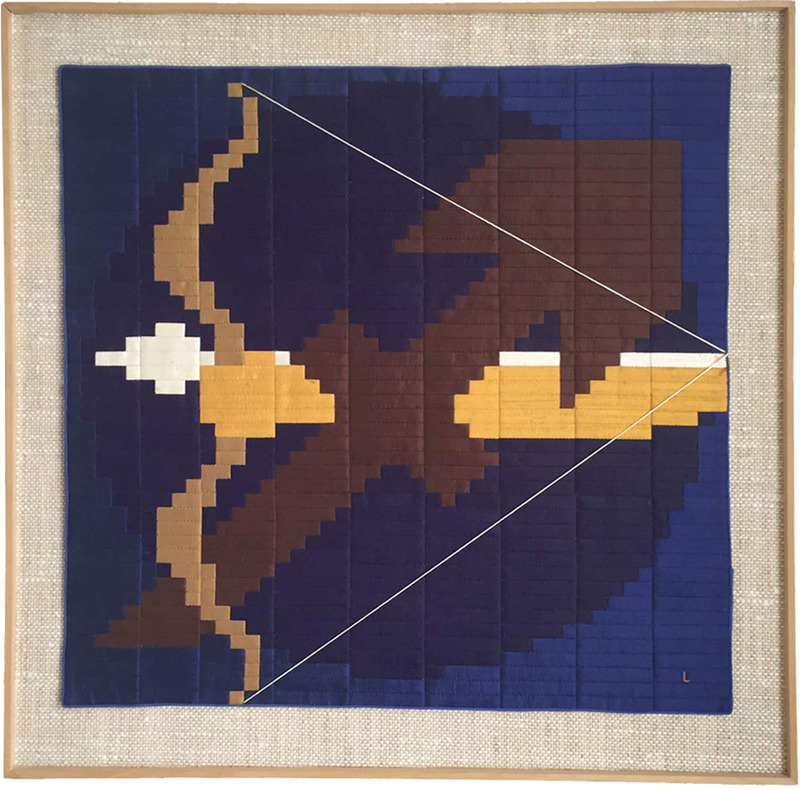 As a result of our collaboration with the V&A social media team to trace 'lost' Lucienne Day silk mosaics, we have received news and images of a number of pieces. We are grateful to all who spread the word or made contact with us, helping to expand our records of these unique works of art. 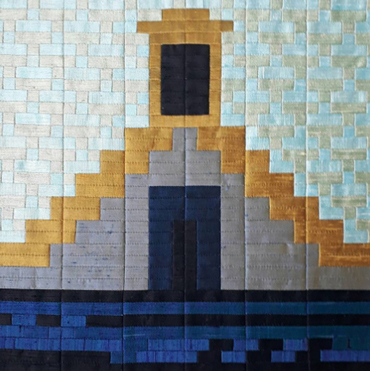 This image of her silk mosaic 'The Boathouse' was kindly supplied by Heather Freeman. As the Lucienne Day centenary year comes to a close we look back on a highly successful programme of exhibitions, events, awards and product launches. We have collaborated with more than twenty organisations nationwide to celebrate Lucienne Day’s long career and her multi-faceted design output. Many initiatives launched this year will be ongoing, with new fabrics and carpets ranges in production and the exhibition Lucienne Day: Living Design continuing on tour throughout 2018. Finally, we are grateful to our PR consultants at Caro Communications and our graphic designers at Studio Fernando Gutiérrez for their dedicated professional input to the Lucienne Day Centenary project. 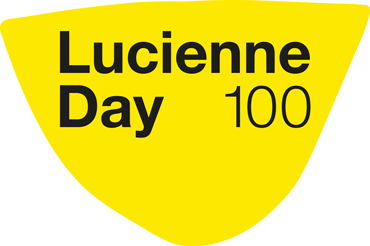 Our Lucienne Day 100 webpage News section, documenting the full story of the centenary year, will stay live online till January 5th 2018. 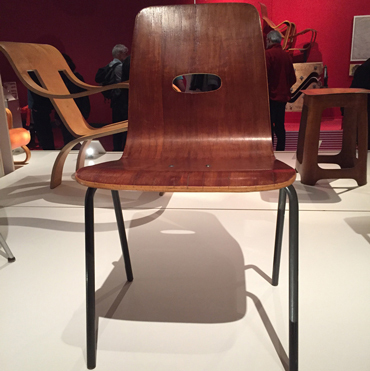 A Robin Day Q-Stak chair donated to the V&A Museum by the designer himself was displayed in the exhibition Plywood: Material of the Modern World held at the Museum this autumn. Robin Day designed the Q-Stak Chair in 1953 for British furniture company Hille to provide light, durable and low-cost seating for contract use. Made from a single piece of moulded plywood mounted on a steel frame, it was far cheaper and easier to manufacture than its predecessor, the Hillestak. Three Robin Day Hillestak chairs on loan from our furniture technician Amos Marchant form part of the exhibiition New Truth to Materials: Wood which opened at the Ditchling Museum of Art and Craft, East Sussex this autumn. The exhibition explores our emotional response to wood through the work of a diverse group of designers, artists and craftspeople. It remains open till 1 January 2018. Robin Day’s elegant and functional Slatted Bench was launched in an authentic new production by London design retailer twentytwentyone at the London Design Festival in September. Flat cushions, modelled on those shown in our archive photographs of the Slatted Bench, are also available, with covers in Mourne Check, a heritage weave designed by Gerd Hay-Edie and widely used by Hille in the 1950s to upholster Robin Day’s furniture. 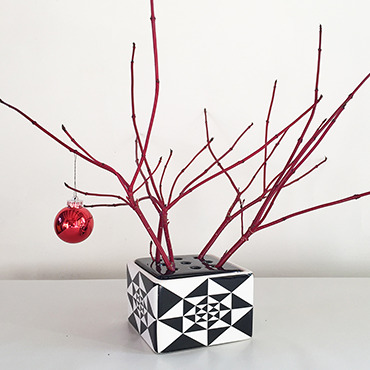 Over the Christmas and New Year period the shop at the Barbican Arts Centre is hosting a display of Robin and Lucienne Day design products supplied by south London design retailer Britain Can Make It. 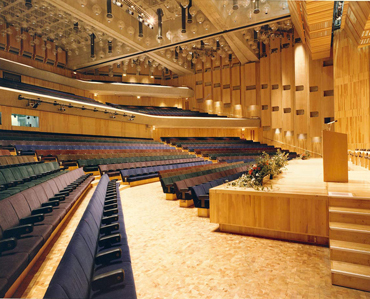 As Seating Design Consultant to the Barbican Arts Centre, Robin Day designed all the original seating for the foyers, restaurants and seven auditoria, the latter still in use today. The major retrospective exhibition Robin and Lucienne Day: Pioneers of Contemporary Design, curated by Lesley Jackson, was held at the Barbican Art Gallery in 2001. 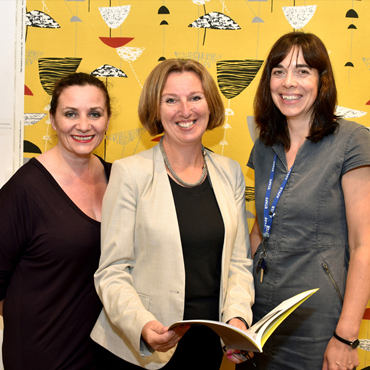 The programme has gathered new momentum over the summer, as more partner organisations, including the V&A Museum, Fashion and Textile Museum, Royal Society of Arts, Glasgow School of Art, Manchester School of Art, Design Manchester and The Home, Salts Mill have joined us to celebrate Lucienne Day’s centenary. We have collaborated with the Victoria and Albert Museum’s textile curators to create a Lucienne Day Online Collection on the V&A website. This includes an introductory article about Lucienne Day’s industrial design career with images of her textiles, wallpapers and ceramics. A second article discusses her later work in silk mosaics, with images from a new photoshoot of the seven pieces held in V&A Collections. The V&A holds the world’s greatest Lucienne Day archive of over three hundred objects, as well as her design papers and photographs. In association with the V&A Museum, we have launched a social media campaign to trace and celebrate Lucienne Day’s silk mosaics. 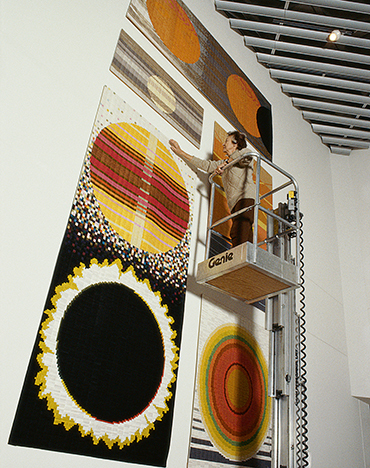 From the mid-1970s to the end of the century Lucienne Day created several hundred silk mosaics. 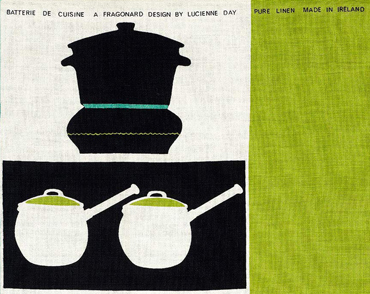 Many were sold to Lucienne Day enthusiasts at exhibitions all over the world. We hold over two hundred and fifty images relating to the silk mosaics in our digital archive, but these records are incomplete. To help us trace and catalogue as many as possible, we are inviting owners of silk mosaics to contact us or to post an image on social media #LucienneDay #silkmosaic. 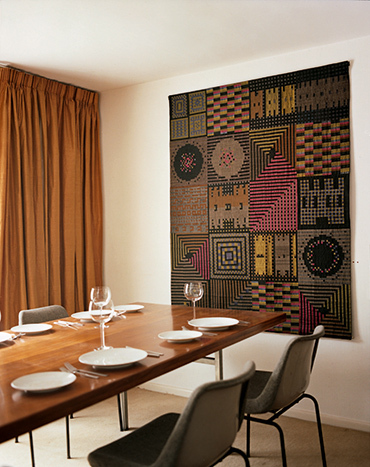 A major Lucienne Day silk mosaic which for thirty years had hung in the hallway of the designer's own home has now been put on public display for the first time. 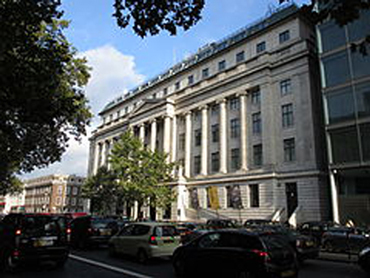 We donated The Castle and Other Stories (1979) to Royal Designers for Industry, based at the Royal Society of Arts, John Adam Street, London, where it may be viewed from 8.30am to 8pm, Monday to Friday. 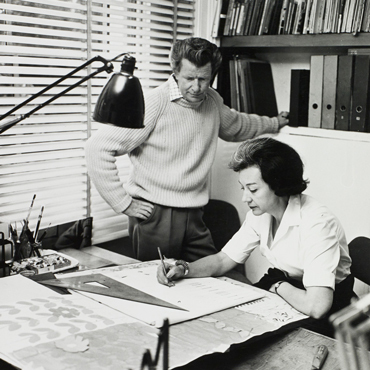 Lucienne Day was elected Royal Designer for Industry in 1962. In 1987 she was appointed first-ever woman Master of the Faculty of Royal Designers for Industry. 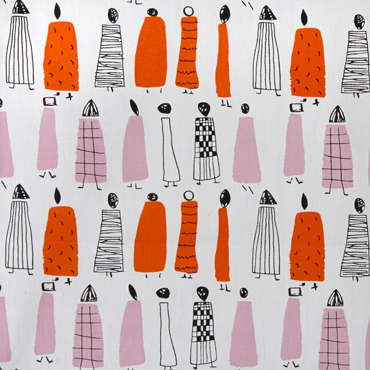 On Thursday September 7th Paula Day will present an illustrated talk about her mother's life and work and the Lucienne Day centenary year at the Fashion and Textile Museum, London. Tickets for this event include a complimentary drink and entry to the exhibition The World of Anna Sui. 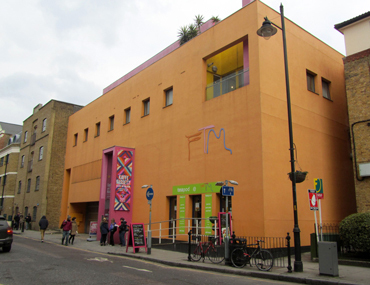 Founded by British designer Zandra Rhodes and now run by Newham College, the Fashion and Textile Museum holds exhibitions and runs courses for creative students and businesses. 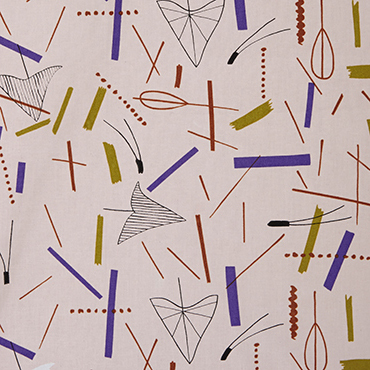 In 2012 the Museum hosted the exhibition Designing Women: Post-war British Textiles which celebrated the work of Lucienne Day, Jacqueline Groag and Marian Mahler. 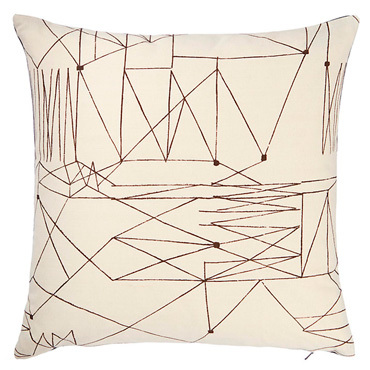 John Lewis has launched a second collection of Lucienne Day cushions. The minimalist design Graphica has been added to the existing range, along with Calyx, Flotilla and Magnetic in alternative colourways. The cushions are made up from Classic Textiles' digital reprints of historic Lucienne Day designs on a substantial linen/cotton mix fabric. 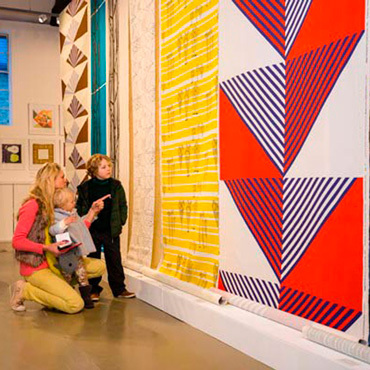 Salts Mill design retailer The Home has mounted a Showcase Homage to Lucienne Day. The owners' exceptional private collection of 1950s/1960s Lucienne Day china tableware for German company Rosenthal is on display along with original Lucienne Day textiles. 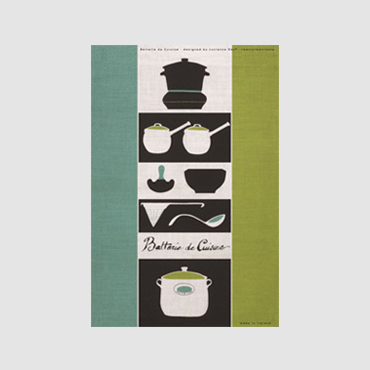 The Home stocks our Lucienne Day 100 Designs poster, along with an extensive range of products designed by Robin and Lucienne Day. The Museum of Carpet is now displaying for the first time its entire archive collection of Lucienne Day's painted carpet designs for Kidderminster-based manufacturer Tomkinson's Carpets. The collection will be on show at the Museum alongside the Arts University Bournemouth touring exhibition Lucienne Day: Living Design until the end of September. On July 20th Emma Hunt, curator of Lucienne Day: Living Design and Deputy Vice-Chancellor of Arts University Bournemouth, spoke to an enthusiastic capacity audience at the Museum of Carpet. The AUB touring exhibition Lucienne Day: Living Design will be shown in Manchester as part of Design Manchester 2017. It will open on October 7th at the Vertical Gallery, spanning three floors of the Benzie Building, home of Manchester School of Art. A panel discussion chaired by exhibition curator Emma Hunt with panel members Sir Christopher Frayling, Jennifer Harris and Paula Day will be held at the Gallery on October 18th. Now in its fifth year, Design Manchester is a city-wide festival of creativity and design running from October 11th – 22nd 2017. The exhibition Pioneers of Post-War Pattern, opening at the Reid Building, Glasgow School of Art on September 16th, will include digital reprints of Lucienne Day’s furnishing fabrics produced by Classic Textiles at the Centre for Advanced Textiles. 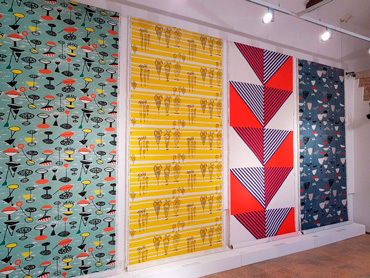 Glasgow School of Art launched Classic Textiles in 2003 with an exhibition of their new Lucienne Day digital reprints, shown alongside a major display of the designer's silk mosaics. The moving and informative full-length documentary Contemporary Days: the Designs of Lucienne and Robin Day will be shown on Thursday October 12th at the School of Textiles, Coggeshall, Essex. The film includes archival photographs and interviews with family, friends and design experts. View film clip. 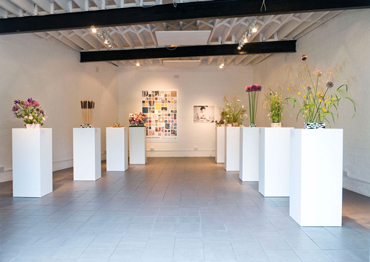 London design retailer twentytwentyone held an exhibition of floral tributes to Lucienne Day at the River Street showroom from June 21st – 24th. Ten individuals from a variety of design backgrounds used a new production of Lucienne Day’s 1966 designs for flower bricks to create diverse displays, ranging from Barber and Osgerby’s minimalist bulrushes to Margaret Howell’s effervescent grasses. Paula Day showed blooms from a climbing rose which had grown in her mother’s own garden. The Centenary Edition of one hundred flower bricks was manufactured by Stoke-based ceramics company 1882 Ltd.
London design retailer twentytwentyone will launch a new production of Robin Day’s Slatted Bench (1954) as part of Edit ’17, an exhibition of classic and contemporary furniture held at the River Street showroom on September 20th – 24th during the London Design Festival. 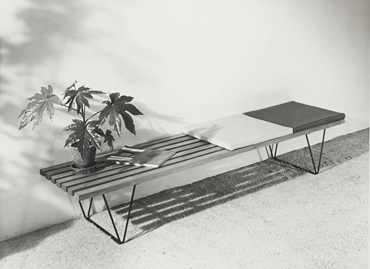 The Slatted Bench was designed in 1954 as a multifunctional interior platform. It can be used to support storage units or television, serve as a coffee table, or provide low seating. Timber slats are supported on a steel rod frame, fulfilling Robin Day's dictum that ‘what one needs in today’s small rooms is to see over and under one’s furniture’ (Robin Day, 1955). We awarded our annual RCA Robin and Lucienne Day Prize to MA Design Products graduates Katrine Hesseldahl and Viktor Strimfors for their work on Strata, a furniture system which addresses the wastage inherent in the design of, for example, a traditional sofa, which may be discarded to landfill simply because of damaged upholstery. Instead, a layer system is proposed, in which the base layer or frame is durable and can be reconfigured to make other kinds of furniture, while the middle and skin layers can be replaced. The Prize is awarded annually to a final-year student of textile or product design whose work reflects Robin and Lucienne Day’s own commitment to social and environmental responsibility as well as high aesthetic quality. 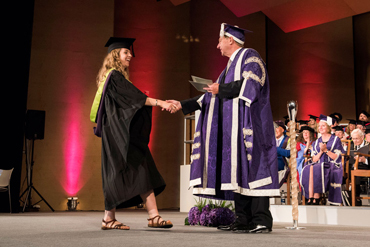 At the Arts University Bournemouth graduation ceremony on June 30th Vice Chancellor Professor Stuart Bartholomew presented Aimee Hartley, BA Textiles graduate, with a special prize for her Final Textile Show. 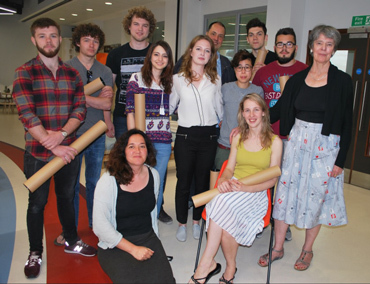 Aimee said: 'Receiving the Robin and Lucienne Day Foundation/AUB prize was such a wonderful honour and a much-needed boost to my confidence when leaving the comfort of University’. The AUB exhibition Lucienne Day: Living Design was first shown in the university’s Gallery and is now touring nationwide. 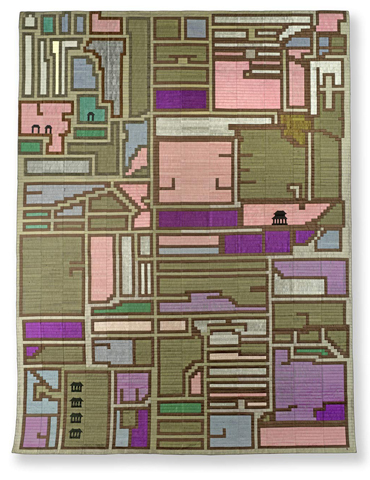 Lucienne Day's 1967 textile Causeway was exhibited in the exhibition Making Space: Women Artists and Postwar Abstraction at The Museum of Modern Art, New York, which closed on August 13th. The Museum of Modern Art holds four Lucienne Day designs in its permanent collection, all of which were donated by Jill A. Wiltse and H. Kirk Brown III from their extensive private Lucienne Day collection. Our centenary poster is available at ten outlets nationwide. Please see our website for a full list of stockists. We also post daily on Twitter @robin_lucienne and Instagram @robinlucienneday. 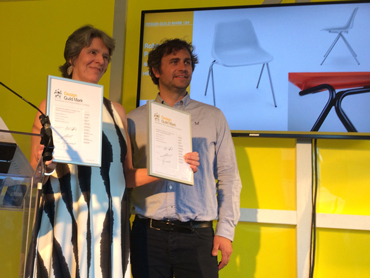 Robin Day’s Polypropylene Side Chair and Armchair have both been awarded the Design Guild Mark by the Worshipful Company of Furniture Makers. 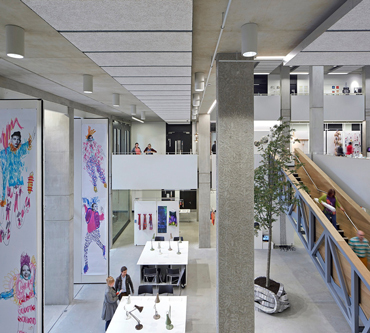 The Awards Ceremony took place at Design Fields, Clerkenwell, London on May 25th (which would have been Robin Day’s 102nd birthday). 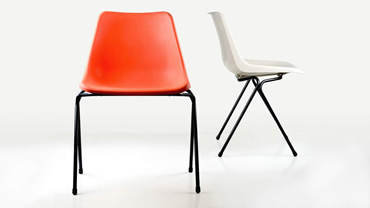 Robin Day’s Polypropylene Chairs have been produced in Britain by Hille ever since they were first launched over fifty years ago. The Design Guild Mark is awarded in recognition of the highest standards of design for volume production within the British furniture industry. 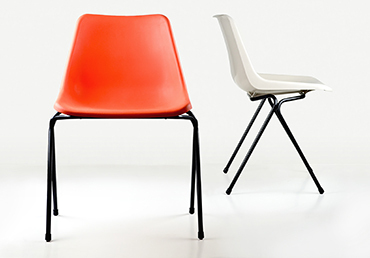 London design retailer twentytwentyone have reissued Robin Day’s Childsply Chair. 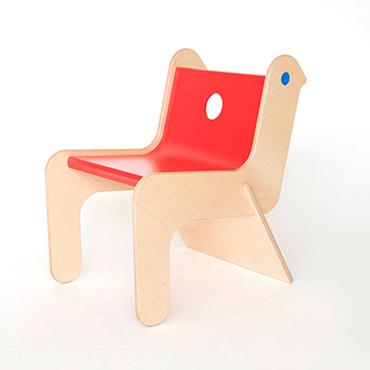 Robin Day designed the Childsply Chair in 1999 in response to a twentytwentyone charity project in which designers were invited to create an item of childrens’ furniture using a single sheet of plywood. 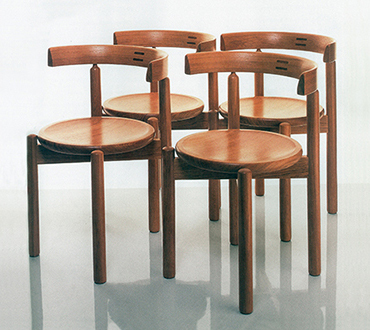 Small batches of the chair were subsequently made by Robin Day’s craftsman friend John Haddock. It has now been put into volume production. 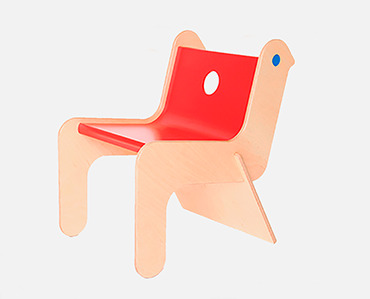 The Design Museum holds an example of the Childsply Chair in its permanent collection. It was also one of the designs shown in the exhibiition Robin Day Works in Wood, held at the V&A Museum during London Design Festival 2015. 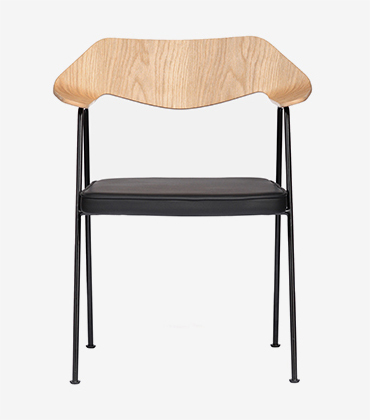 A Special Edition of Robin Day’s 675 Chair has launched at the Conran Shop. Manufacturers Case Furniture have produced a limited edition of the 1952 design classic with upholstery by Mourne Textiles. 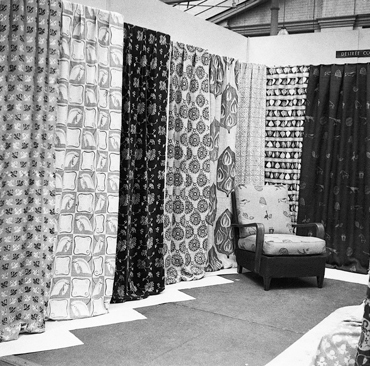 In the 1950s Robin Day collaborated with Gerd Hay-Edie, founder of Mourne Textiles, on upholstery for his furniture designs. The 675 Chair Special Edition features Mourne Check, a heritage tweed which has been brought back into production by Gerd Hay-Edie’s grandson Mario Sierra. The Special Edition is available in three Mourne Check heritage colours - Granite, Bilberry Blue and Robin Red, thought to be Robin Day’s favourite version. We are delighted that several more partner organisations have joined us to celebrate Lucienne Day’s centenary this year. These include London design retailer twentytwentyone, the Museum of Carpet in Kidderminster and the School of Textiles, Coggeshall, Essex. In this Newsletter we report on the spring’s events and share news about what’s coming up this summer. The Carpet Museum is celebrating Lucienne Day's centenary by showing the touring exhibition Lucienne Day: Living Design alongside their own unique archive collection of original hand painted carpet designs by Lucienne Day. 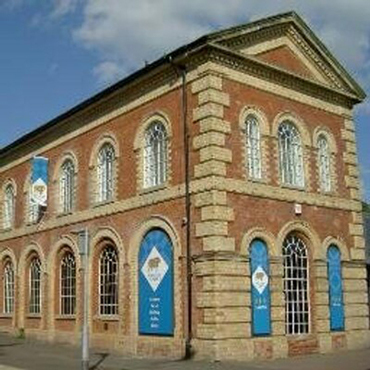 The Carpet Museum is the only museum in the UK dedicated to carpets and carpet making. We have collaborated with London design retailer twentytwentyone and Stoke-based ceramics company 1882 Ltd to reissue two of Lucienne Day’s flower brick designs. The flower brick has its origins in the decorative Delftware produced during the 18th century to hold ornate floral displays. 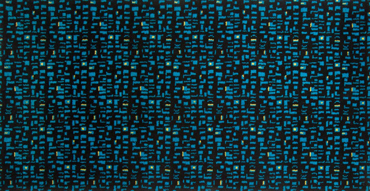 In 1966 Lucienne Day reinterpreted this historic genre in a collection of distinctive contemporary designs. A celebratory limited edition of one hundred pieces will be launched at twentytwentyone on June 20th at Day for Flowers exhibition. 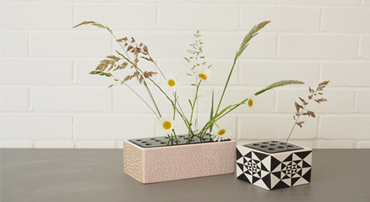 Design retailer twentytwentyone is celebrating Lucienne Day's centenary with Day for Flowers, an exhibition of floral displays to mark the launch of a new production of Lucienne Day's Flower Bricks. 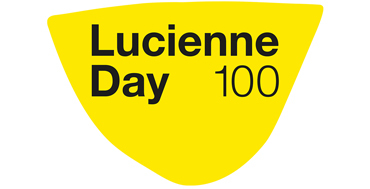 Ten creative individuals from the worlds of fashion, design, interiors, architecture and journalism will participate by creating a display using a Lucienne Day flower brick. This free all-day event at the Whitworth Art Gallery, Manchester will include a tour of the exhibition Lucienne Day: A Sense of Growth led by the curator Jennifer Harris, a print-making workshop inspired by the work of Lucienne Day, a talk by Paula Day about plants in her mother’s life and work, and a screening of the documentary film Contemporary Days: the Designs of Lucienne and Robin Day. 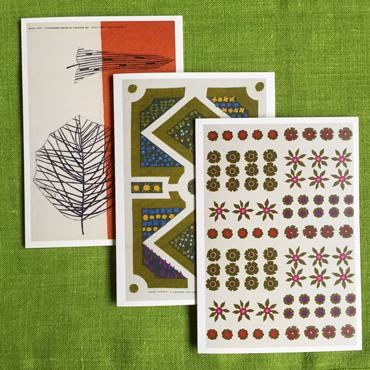 The Whitworth Art Gallery shop has launched a range of greetings cards, postcards and mini-prints featuring mages of Lucienne Day’s plant-inspired textiles. 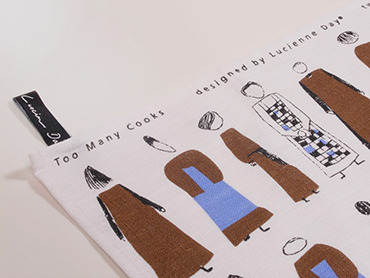 Other Lucienne Day products available at the shop include tea towels, books and our Lucienne Day 100 Designs poster. Distinguished textile historian and Honorary President of the Textile Society Mary Schoeser will speak about Lucienne Day. The talk will open with a filmed interview with Paula Day, daughter of Lucienne and Robin Day, who will talk about her mother’s design process and her parents’ mutual influence. 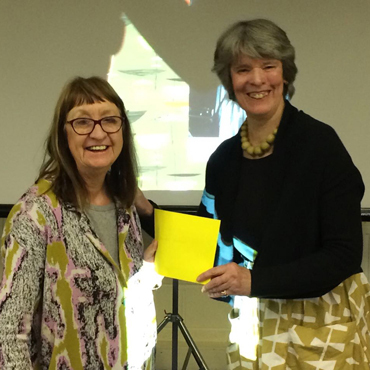 Paula Day presented Jennifer Harris with our Centenary Award for Lifetime Contribution to Lucienne Day Studies at the Textile Society’s Antique and Vintage Textile Fair, Manchester on April 30th. Jennifer then gave an illustrated talk about Lucienne Day and her work. In 1993 Jennifer Harris curated the first-ever Lucienne Day retrospective, Lucienne Day: A Career in Design, at the Whitworth Art Gallery, Manchester. She is also the curator of the current Whitworth exhibition Lucienne Day: A Sense of Growth. 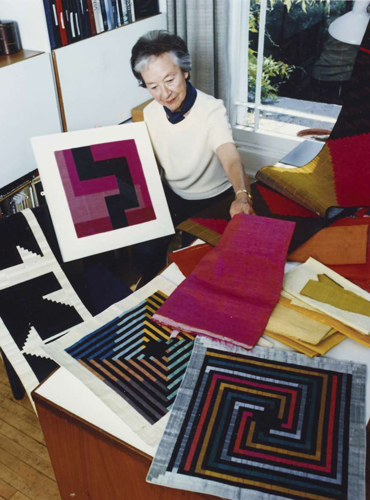 Lucienne Day was the first Honorary President of the Textile Society, a position she held from 1993 to 2003. A packed audience attended Paula Day's illustrated talk about her mother's life and work at Farfield Mill, Sedbergh, Cumbria on April 23rd. A selection of Lucienne Day’s printed textiles and silk mosaics were on display. 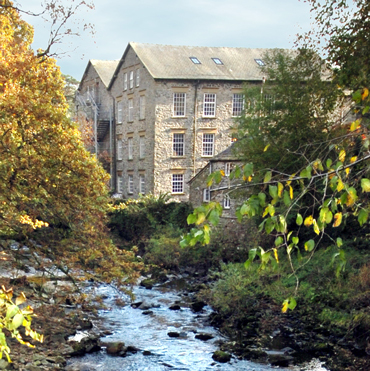 Farfiled Mill is an arts, crafts and heritage centre housed in a restored Victorian woollen mill in the Yorkshire Dales. BBC Radio 4 has featured the Whitworth exhibition Lucienne Day: A Sense of Growth on three occasions in the last six weeks. 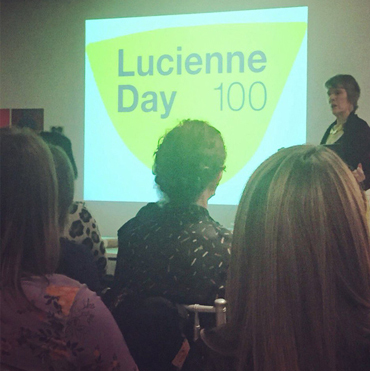 Our PR consultants Caro Communications are continuing to achieve an exceptionally high level of coverage of the Lucienne Day Centenary Celebrations in regional, national and international press. Our centenary poster is available at a growing number of outlets all over the country. Please see our website for a full list of stockists. 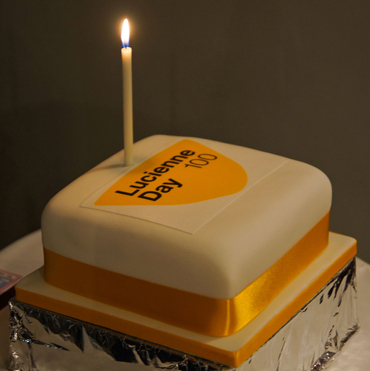 We are continuing to work with partner organisations all over the country to celebrate Lucienne Day's centenary year. 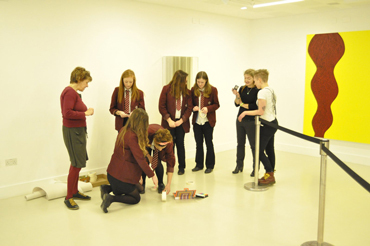 In this Newsletter we report on what's happened so far and share news about exhibitions and events opening this spring. 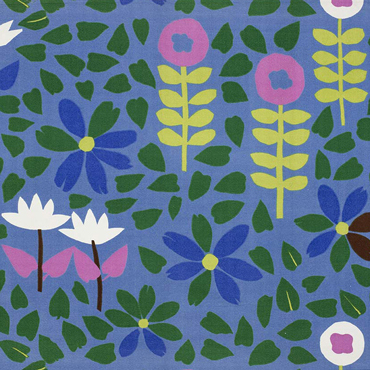 Lucienne Day was a passionate gardener and many of her textile designs were inspired by the patterns she saw in plant-forms, leaves, flowers and trees. This show is part of the gallery's GROW project which promotes the benefits of engaging in horticultural activities to improve mental wellbeing. 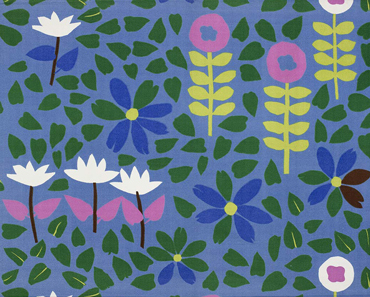 Groups and individuals within the local community who are experiencing social isolation or dealing with issues around mental health have worked with Paula Day to select plant-inspired works from the Whitworth's extensive Lucienne Day archive. The exhibition includes a display of Lucienne Day’s gardening implements and images of her own garden. Curator Jennifer Harris and Paula Day will open and introduce Lucienne Day: A Sense of Growth in the Collections Centre, which looks out over the Art Garden. There will be an opportunity to view a short film about the GROW project. This will be followed at 7pm by a Contemporary Floral Art: Art Alive event. You are invited to observe international floral designer Craig Bullock’s thinking process from research to realisation as he responds to Lucienne Day’s designs to create a 3D floral sculpture. 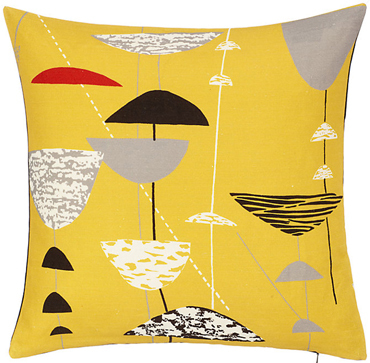 British retailer John Lewis has launched an exclusive range of six cushions created using Lucienne Day at Classic Textiles fabrics. They feature 1950s designs Calyx, Flotilla, Dandelion Clocks, Lapis, Spectators and Magnetic. The Flotilla and Magnetic cushions have been produced in a limited edition of only one hundred units each to celebrate Lucienne Day's centenary. 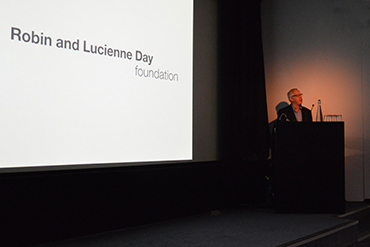 To celebrate Lucienne Day’s centenary year, the Foundation has created a one-off Award for Lifetime Contribution to Lucienne Day Studies, in association with the Textile Society. 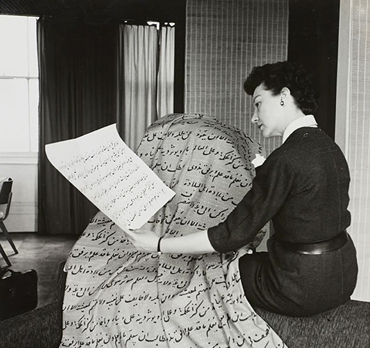 Lucienne Day was the first Honorary President of the Textile Society, a charity dedicated to the study of the history, art and design of textiles. The Award for Lifetime Contribution to Lucienne Day Studies will be presented by Paula Day at the Textile Society’s annual Antique & Vintage Textile Fair, to be held at the Armitage Centre, Manchester. 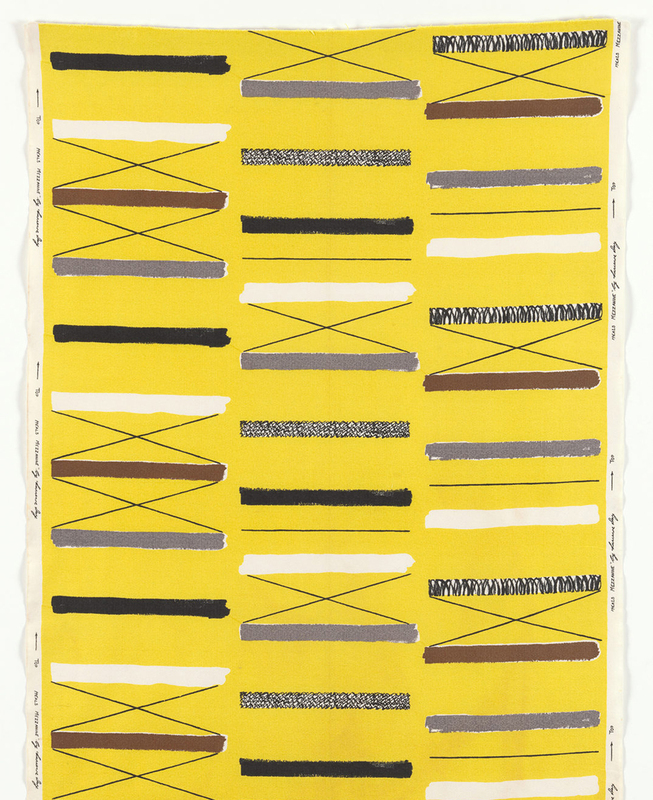 The Textile Society bienniaI research day ‘Research Strategies IV’ will include papers devoted to research which focuses on the post-war era and the work of designers who were contemporaries of Lucienne Day. 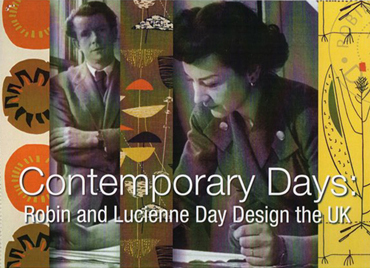 Paula Day will talk about the Foundation’s Lucienne Day digital archive project. Paula Day will present an illustrated talk about her mother’s life and work, including her love for the landscapes of Cumbria. Lucienne’s silk mosaic The Howgills will be on display at the event alongside some examples of her printed textiles. 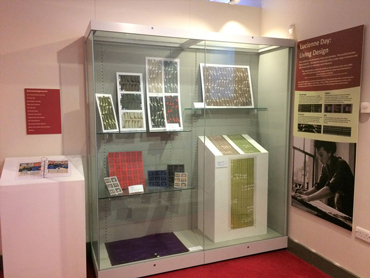 Lucienne Day's carpet design Tesserae (1957) takes pride of place in the Bowes Museum Design Centre Awards display - a rare collection of modern design classics in the newly re-opened Fashion and Textile Gallery. The exhibition about the Days' work as Design Consultants to the John Lewis Partnership has now been extended to the summer. 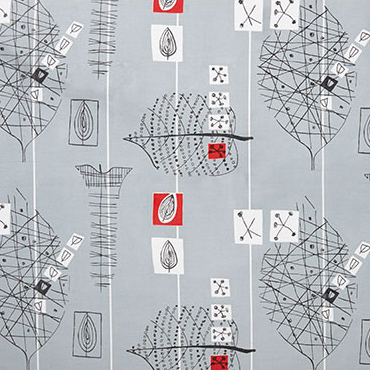 The adjacent display of Lucienne Day's textiles will remain on show to the end of the year. 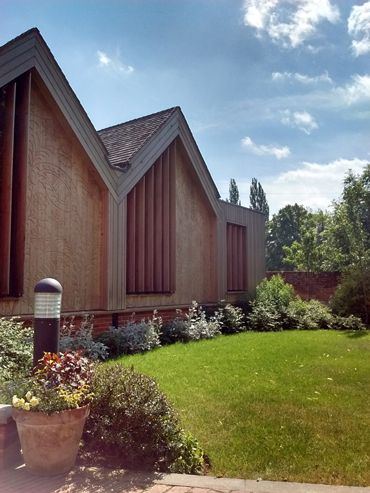 The Heritage Centre is open to the public on Saturdays from 10am - 4pm, and by appointment. Lucienne Day: Living Design launched at The Gallery, Arts University Bournemouth on January 12th. A capacity audience attended a panel discussion chaired by curator Emma Hunt with panel members Sir Christopher Frayling, Jennifer Harris and Paula Day. The exhibition was formally opened by Sir Christopher Frayling, Chancellor of AUB and Patron of the Foundation. 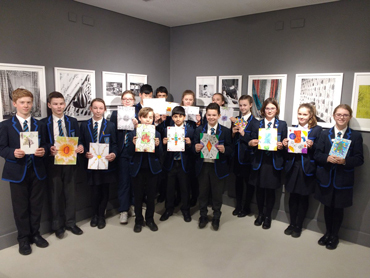 The exhibition, which included a chronological sequence of images from the Foundation’s digital archive and an impressive array of current productions of Lucienne Day’s designs, was widely acclaimed and has provided a resource for numerous student projects and schools workshops. Image: Courtesy The Gregg School. 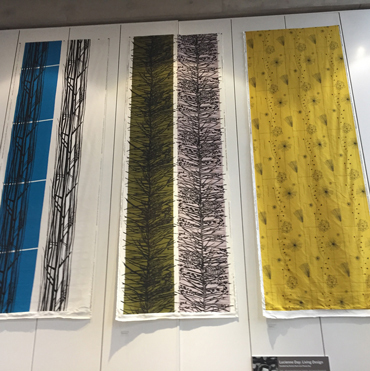 Lucienne Day textile panels will remain on display in the restaurant of Pallant House Gallery, Chichester, till June 11th. The restaurant is furnished with Robin Day’s chairs and was the venue for Lucienne Day’s ‘100th birthday’ tea party. The Lucienne Day centenary celebrations were symbolically launched on January 5th, Lucienne Day’s birthday, when her daughter Paula lit a single candle on her mother’s ‘100th birthday’ cake at a tea party event organised by local designer Alys Bryan in the restaurant of Pallant House Gallery, Chichester, a few minutes’ walk away from the Days’ former home. Our centenary poster is available from selected outlets including Design Museum Shop, The Home, Pallant House Bookshop, Persephone Books, twentytwentyone and Whitworth Shop. It may also be ordered online from twentytwentyone. 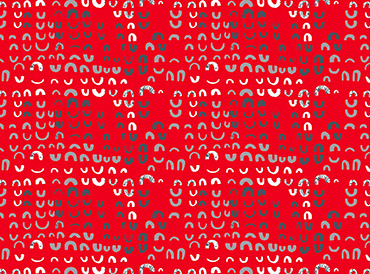 On January 29th the Foundation hosted the Design Museum’s Font Sunday on Twitter, with the theme #fontsonfabric. 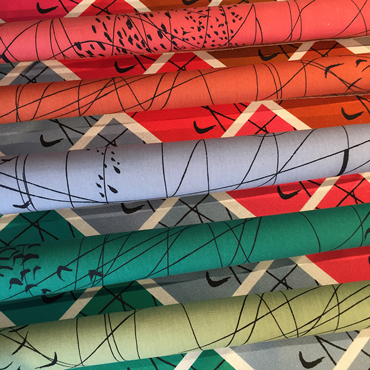 Nine images of Lucienne Day textiles based on lettering were posted online, and thousands of participants sent in images. The #LucienneDay100 Font Sunday was trending on Twitter for much of the afternoon. 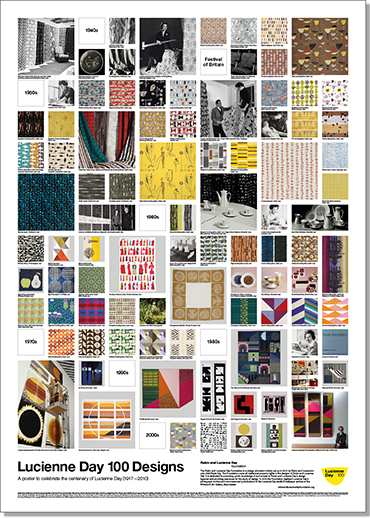 Lucienne Day 100 goes live! 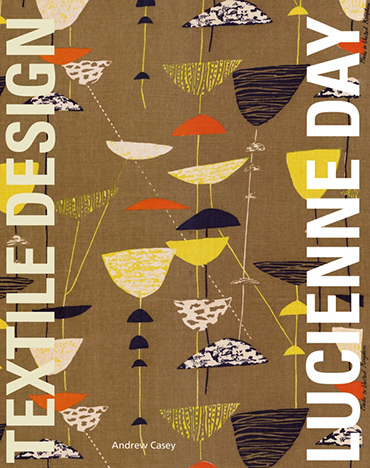 Lucienne Day was born on January 5th 1917. On would have been her 100th birthday, we are launching a programme of celebrations taking place at venues right across the country all through her centenary year. Our Lucienne Day Centenary webpage launches on our website today, with all confirmed exhibition and event listings, shopping information and our pick of the #LucienneDay100 social media posts. A selection of the exhibitions and events launching early in the year is included below. Much more to come in our Spring Newsletter. Our Lucienne Day 100 Designs poster launches today at selected outlets nationwide. Designed by Studio Fernando Gutiérrez especially for the centenary, it celebrates Lucienne Day's six-decade design career and showcases a wealth of images from our newly-developed Lucienne Day digital archive, many of which have never before been published. 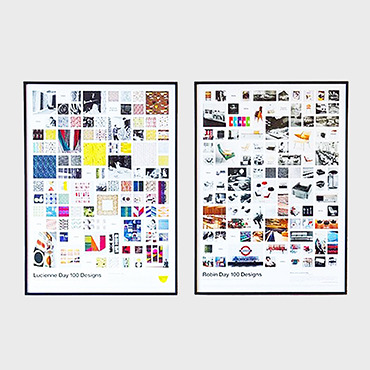 The poster may be purchased online from London design retailer twentytwentyone. In their last years Lucienne and Robin Day made their home in Chichester. Pallant House Gallery holds one of the country’s finest collections of 20th century British art and its restaurant, furnished with Robin Day’s chairs, is hosting a display of Lucienne Day textiles. 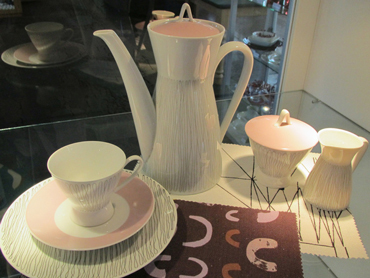 A celebratory afternoon tea party organised by local designer Alys Bryan will be held at Pallant House Gallery. Paula Day will talk about her mother's life and work, and the programme of events taking place nationwide in her centenary year. 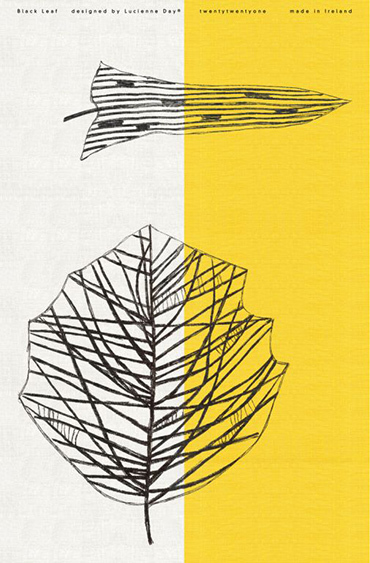 Guests will receive as a memento a limited-edition cotton napkin featuring a rare Lucienne Day print. A display of Persephone Books publications with Lucienne Day textile design endpapers. 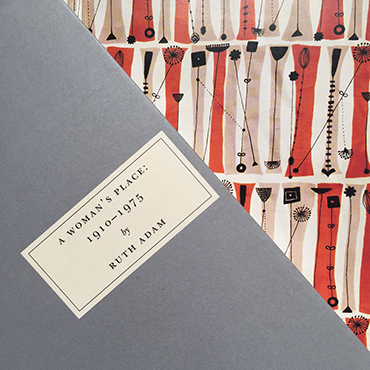 Lucienne Day agreed to the use of her designs on these high-quality reprints of titles by mid-twentieth century women writers. This exhibition reveals the lasting influence of Lucienne and Robin Day in their twenty-five years as joint Design Consultants to the John Lewis Partnership. Their coherent and consistent style, reflecting the enterprising and enlightened ideas behind the co-owned business, can still be identified in the stores today. 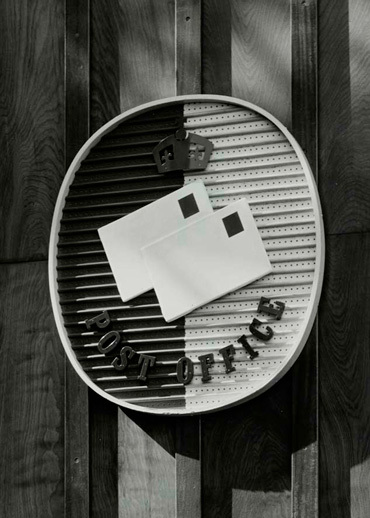 The Heritage Centre holds an archive of documents and images which chart this relationship, as well as a unique collection of Lucienne Day's own original textiles artwork. We have been working with our licensee Classic Textiles on new productions of Lucienne Day's designs Lapis (1953) and Silver Birch (1958). The authentic new prints have been carefully colour-matched to original 1950s textiles held at Whitworth Art Gallery, Manchester, and to Lucienne Day's own artwork for Silver Birch, held at the John Lewis Heritage Centre, Cookham. The two designs will launch exclusively at John Lewis, as part of a range of Lucienne Day at Classic Textiles furnishing fabrics and exclusive new cushions available at selected branches from early in 2017. This exhibition tells the story of Lucienne Day’s design career, unfolding in a sequence of photographs drawn from the archives of the Robin and Lucienne Day Foundation. This is complemented by a vibrant display of original silk mosaics and an impressive array of current or recent productions of Lucienne Day’s designs for curtains, dress fabrics and tea towels, demonstrating the continuing vitality of her design legacy. In a lifetime of dedicated design practice, Lucienne Day created a body of work which is steadily coming back into commercial production to excite and inspire a new generation. To mark the opening of the exhibition Lucienne Day: Living Design, a panel chaired by exhibition curator Professor Emma Hunt will discuss the life and work of Lucienne Day. Panel members will include Professor Sir Christopher Frayling, Dr Paula Day and Dr Jennifer Harris. After an introduction and visit to the exhibition, participants will be invited to make decorative artwork inspired by the colours and repeats of Lucienne Day’s designs using a variety of papers and graphic materials. A talk and film screening for schools and college students. Elements of Robin Day's studio on loan from the Foundation have been installed in the Sackler Library in the new Design Museum. Items on display include his drawing table, drawing implements, set-squares and small models, together with part of Robin and Lucienne Day’s art and design books collection. The Design Museum re-opened to the public at its new site, the former Commonwealth Institute in Kensington High Street, on November 24th. Some of Robin Day’s 1961/62 carpet designs for Woodward Grosvenor, now held in the Brinton’s Carpets archive, are on show at Midlands Modern, Parkside Gallery, Birmingham till January 14th 2017. The exhibition showcases products manufactured by Midlands based companies working with significant designers from 1930 to 1980. Robin Day’s Polypropylene side chair and armchair with white shell and chrome frame are now available to pre-order from John Lewis. 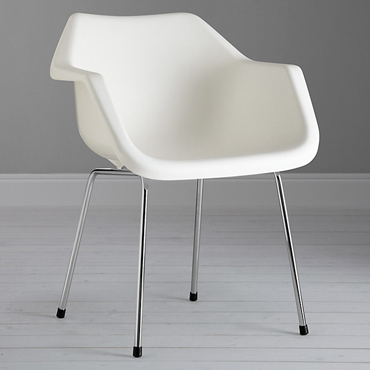 White was one of the ‘second generation’ of Polypropylene Chair colours launched by British furniture company Hille in the late 1960s. 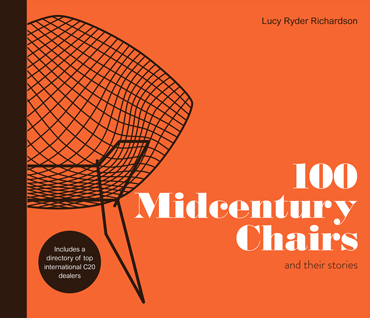 This new Pavilion Books publication by Lucy Ryder Richardson, co-founder of Midcentury Modern Shows, features her personal selection of international 20th century chair designs. 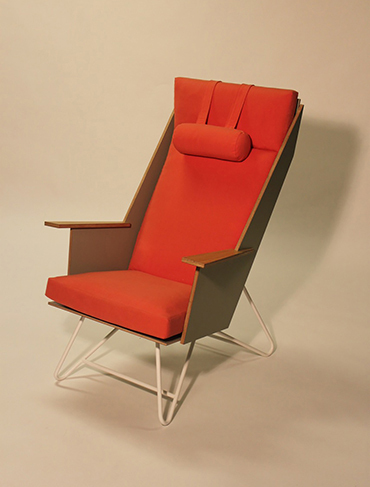 Robin Day is represented by his Hillestak, 675 Chair and Reclining Chair. We are now posting @robinlucienneday on Instagram and @robin_lucienne on Twitter. 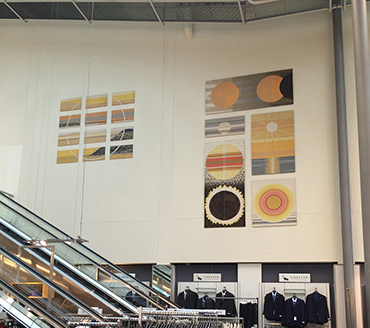 Lucienne Day’s monumental silk mosaics Aspects of the Sun (1990) and Islands (1991) have been rehung at John Lewis Kingston. 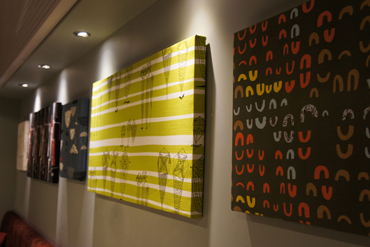 The pieces were commissioned for the lofty coffee shop in the new John Lewis store at Kingston-upon-Thames. Aspects of the Sun consists of six variations on a solar theme, while the twelve panels of Islands together depict a single landscape. This September both works were rehung on an expansive wall above the menswear department. 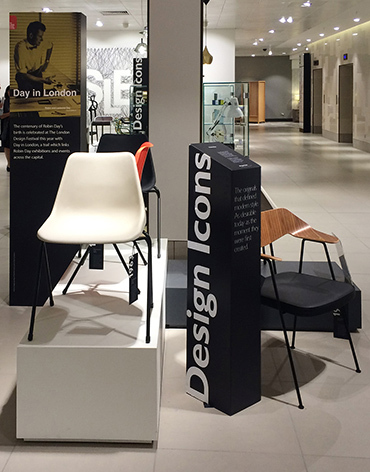 They can now be viewed across the store from the Design Icons furniture area where Robin Day’s chairs are on display. We are preparing to celebrate Lucienne Day’s centenary next year with a nationwide programme of exhibitions and events, due to launch online on her ‘100th birthday’, January 5th 2017. Studio Fernando Gutiérrez have designed the graphics and publicity will be managed by Caro Communications. We are creating a Lucienne Day 100 Designs poster which will display a wealth of previously unpublished images from our newly-developed Lucienne Day digital archive. 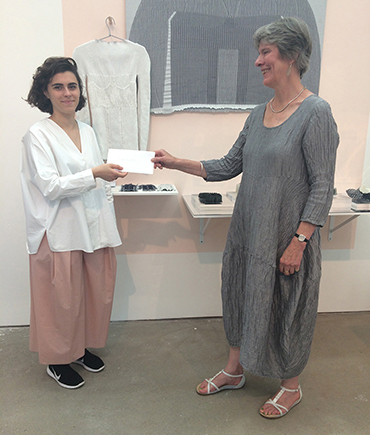 This year we awarded the RCA Robin and Lucienne Day Prize to Woven Textiles MA student Jacqueline Lefferts for her pioneering work on single-process garment construction. By merging the manufacture of fabrics and fashion, materials wastage and shipping between links in the supply chain can be reduced. The Robin and Lucienne Day Prize is awarded annually to a final-year student of textile or product design whose work, in the judgement of the RCA Rector and Foundation Chair, reflects Robin and Lucienne Day’s own commitment to social and environmental responsibility as well as high aesthetic quality. 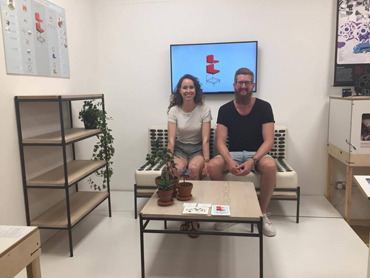 Robin Day Centenary Project winner Madara Degtere exhibited her winning lounge chair at New Designers, London in July, alongside work by fellow Bucks New University furniture BA Hons graduates. Paula Day wrote about the importance of respecting designers’ legacies in a piece published in Caro Communications’ Bulletin in August. "My father’s name represents a lifetime of dedicated design practise" she explained. An exhibition celebrating the life and work of Gerd Hay-Edie, inspirational weaver and founder of Mourne Textiles, has just opened at the Margaret Howell shop in London. 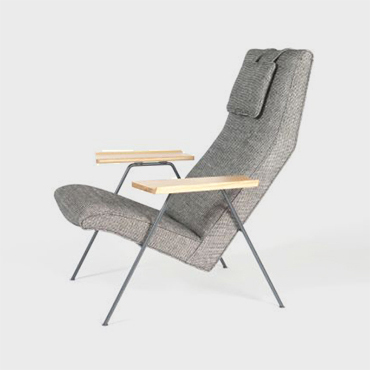 The exhibits include vintage examples of Robin Day's Slat Chair (1952) and Telechair (1953), as well as London design retailer twentytwentyone's new production of his Reclining Chair (1952). All three chairs are upholstered in the Mourne Check weave which was extensively used by furniture company Hille on Robin Day's designs. We have now re-licensed Persephone Books who with Lucienne Day's agreement used her designs as endpapers for some of their beautifully-produced publications. Horse's Head (1940) is used for Princes in the Land by Joanna Cannan, Palisade (1952) for A Woman's Place 1910 - 1975 by Ruth Adam, and Plantation (1958) for Lettice Delmer by Susan Miles. 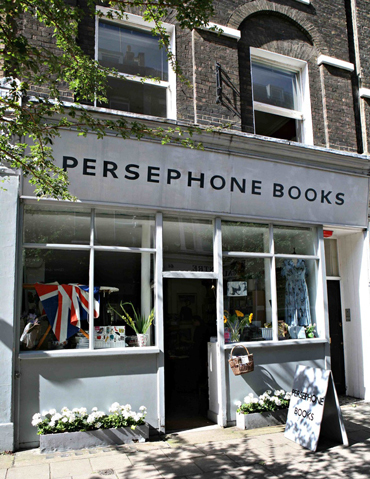 Persephone Books specialise in reprinting titles by mid-twentieth century women writers. We have appointed Caroline Roberts as the Foundation’s new administrator. Caroline has a background in textiles and design curation. Currently she delivers editorial and PR projects for a variety of design-led clients as well as running Grafik.net. Foundation Chair Paula Day visited her father’s birthplace High Wycombe on June 10th to review full-size design prototypes developed by Buckinghamshire New University BA Hons Furniture students on the final stage of the Robin Day Centenary Project. 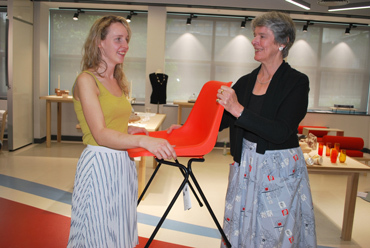 She presented a Robin Day Polypropylene Chair to the winner, Madara Degtere. The project was launched in November 2015 and run by the Foundation’s furniture technician Amos Marchant and the University’s furniture tutors Fiona Davidson and Alex Hellum. Paula Day said: It was a pleasure to see the very wide range of excellent work developed by students who participated in the Robin Day Centenary Project. Madara Degtere's reclining chair stood out; careful thought had gone into every aspect of the design…and the result was visually interesting and very comfortable. The high standard of work is a tribute to the staff and students of the furniture department. I am deeply saddened to learn that the University has now closed the department. This is the institution which trained my father and many other leading furniture designers up to the present day. For over 100 years it has held in trust and passed on to successive generations the accumulated furniture experience of High Wycombe, historic heart of the furniture industry. The tragic loss this closure represents to the British design industry is underlined by the outstanding quality of the work produced by students in this final year. 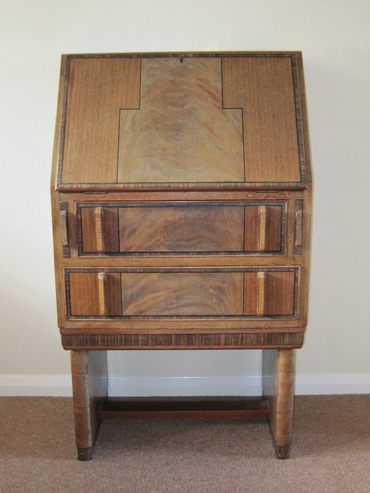 An inlaid bureau owned by Robert Simmons, whose family were neighbours of Robin Day’s parents at Hughenden Road, High Wycombe, has been identified as a student piece made by Robin Day at High Wycombe School of Art (now Buckinghamshire New University) c.1932. This is the earliest known design by Robin Day. 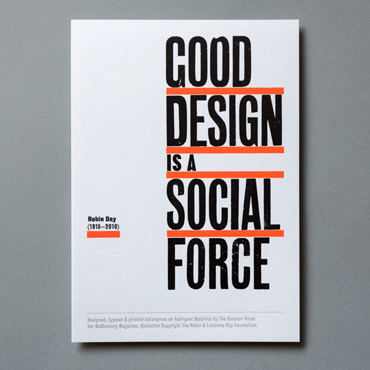 Midcentury Magazine have published a limited edition A5 letterpress print inspired by Robin Day’s words: In my long years of designing, the thing that has always interested me is the social context of design and designing things that are good quality that most people can afford. It was always my mission to mass-produce low-cost seating, because I do think that clarity and what we call 'good design' is a social force that can enhance people's environments. (Robin Day, 1999). The print completes a set of three inspired by the words of Le Corbusier, Charles Eames and Robin Day respectively. Midcentury Magazine is a twice-yearly publication which celebrates the best of 20th century furniture, interiors and architecture. Foundation Chair Paula Day is touring John Lewis stores with Design Icons areas to talk to furniture sales staff about her father’s designs. John Lewis carries the Robin Day 675 Chair, produced by Case Furniture, and the Robin Day Polypropylene Side Chair and Armchair, manufactured by Hille. Days in Sussex, a design event organised by Alys Bryan, took place on April 9th at The Novium, Chichester before a capacity audience. Paula Day presented an illustrated talk about her parents’ lives and work. 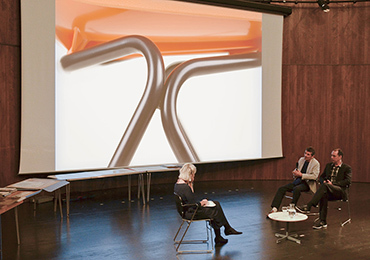 Distinguished design journalist Peter Murray chaired a panel discussion on the Days’ contemporary significance with designers Gerardine Hemingway and Charlie Fowler. Audience members viewed an exhibition of Robin and Lucienne Day’s designs and received a complimentary copy of the Robin Day 100 Designs poster courtesy of London design retailer twentytwentyone. The Foundation has commissioned Gwen Riley-Jones of the Centre for Heritage Imaging, Manchester University to digitise Lucienne Day’s own collection of over 600 photographic prints and slides, and Michael Pollard to photograph the Whitworth Art Gallery’s archive of over 300 Lucienne Day textiles, carpets and wallpapers, the majority of which were donated to the Gallery by the designer herself. Together with nearly 70 images of textiles in their private collection generously shared by Kirk Brown and Jill Wiltse and 30 images of designs in their archive kindly provided by the John Lewis Partnership, this new digital material will form a comprehensive record of Lucienne Day’s work from 1940 to the end of the century. 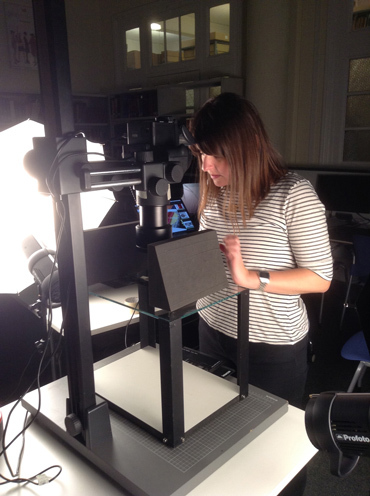 Cataloguing is now underway, with input from design historian Lesley Jackson. Foundation archivist Wilhelmina Baldwin has put in place a system for recording permissions and credits requirements for all images. 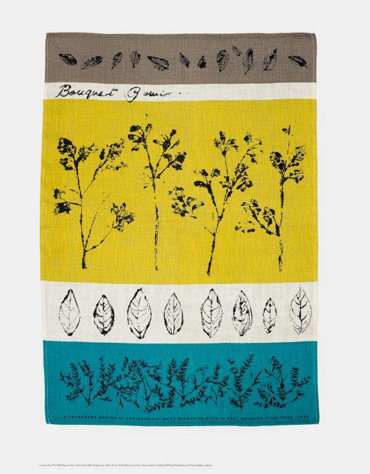 Fine art publishers Bookroom Art Press are launching four high-quality limited edition prints of tea towels designed by Lucienne Day from 1959 onwards for Belfast-based linen company Thomas Somerset. The prints show images of original textiles held in the archives of the Whitworth Art Gallery, Manchester. 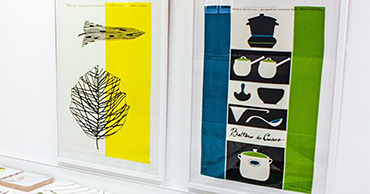 The Bookroom Art Press specialise in reproducing the work of 20th century fine artists including Eric Ravilious, Victor Pasmore and Patrick Caulfield. Their limited edition prints are stocked in Art Gallery shops nationwide. The Lucienne Day series marks a new departure and will place her work alongside that of some of Britain’s most distinguished fine artists of the 20th century. 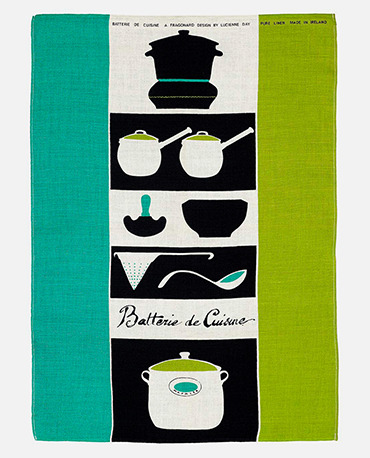 Lucienne Day tea towels in pure Irish linen are available from London design retailer twentytwentyone. For the second year running the Foundation will be making an award at the Royal College of Art. 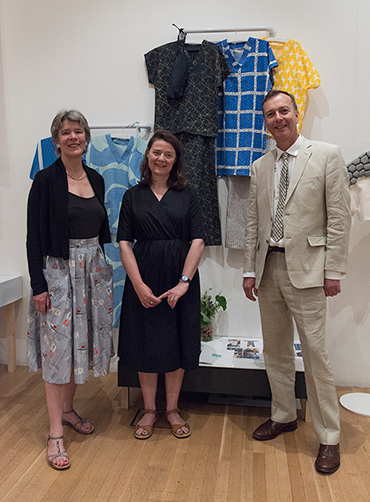 The Robin and Lucienne Day Prize will be awarded to a final-year student of textile or product design whose work, in the judgement of the RCA Rector and Foundation Chair, reflects Robin and Lucienne Day’s own commitment to social and environmental responsibility as well as high aesthetic quality. In 2015 the prize was awarded to Printed Textiles MA student Lucy Rainbow for her designs for NHS hospital workwear in sustainable fabrics such as hemp. 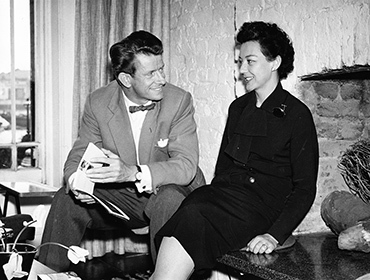 Robin and Lucienne Day both studied at RCA and met there in March 1940. The Foundation is now posting @robinlucienneday on Instagram and @robin_lucienne on Twitter. 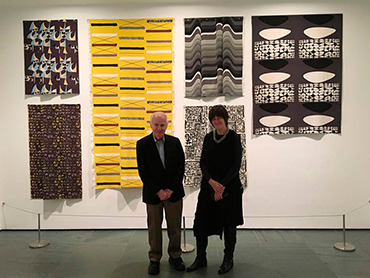 Lucienne Day’s designs Magnetic (1957) and Mezzanine (1958) (shown here with George Kravis and Juilet Kinchin, Curator of Historical Design) are on display at the Museum of Modern Art, New York. 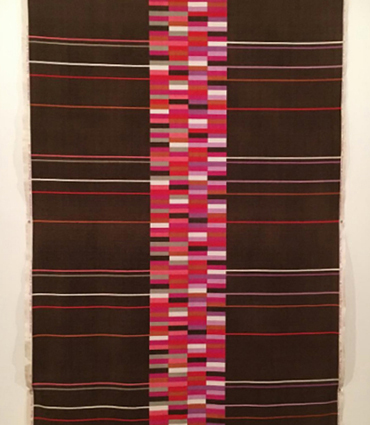 The textiles were presented to the Museum on a part-gift basis by Kirk Brown and Jill Wiltse, whose extensive Lucienne Day textile collection has been widely exhibited at venues including the Textile Museum, Washington DC, the Fashion & Textile Museum, London, and Pallant House Gallery, Chichester. Kirk Brown and Jill Wiltse founded Denver-based not-for-profit foundation Design Onscreen, which made the documentary film Contemporary Days: the Designs of Lucienne and Robin Day (2010). On April 9th 2016 Paula Day and a panel of design professionals including Gerardine Hemmingway and Charlie Fowler will speak about her parents’ lives and work at The Novium Museum, Chichester, West Sussex. Robin and Lucienne Day had close links with Sussex and lived in Chichester for their final decade. 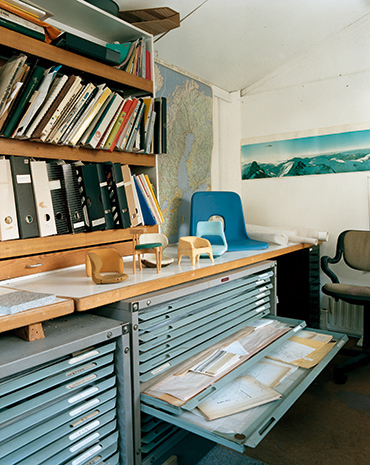 Days in Sussex is organised by local designer Alys Bryan, who was one of the Bucks New University Furniture MA students to visit Robin and Lucienne Day at their Chichester home in 2006. 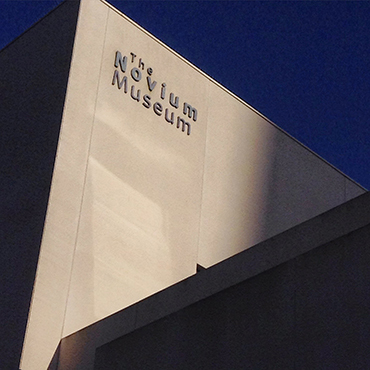 The Novium received an RIBA Award for architectural excellence in 2014. The restaurant at Pallant House Gallery in Chichester has been re-furnished with Robin Day’s 675 Chairs and West Street Chairs. 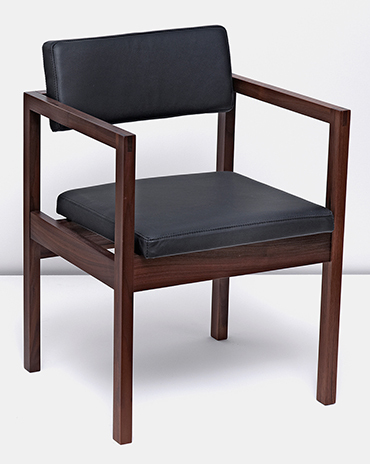 Robin Day finalised the West Street Chair design for Case Furniture in 2006 when he was living at West Street, Chichester. 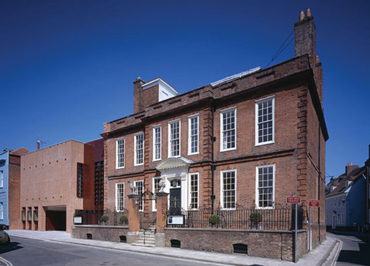 Pallant House Gallery holds one of the country’s finest collections of Modern British Art. 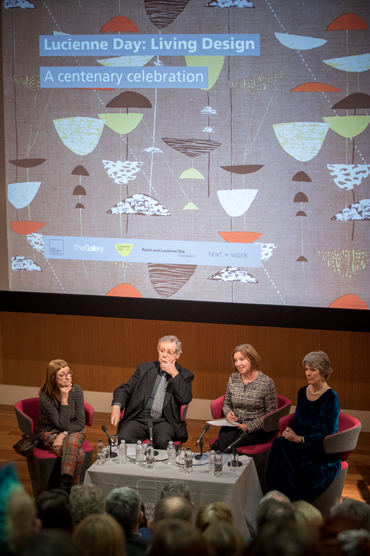 In 2011 the Gallery held an exhibition entitled Robin and Lucienne Day: Design and the Modern Interior. 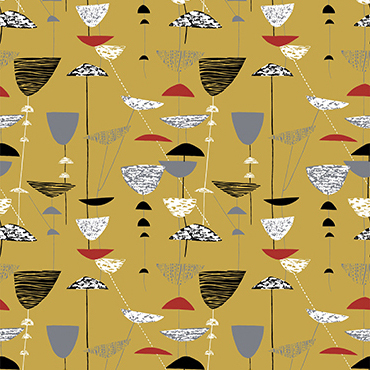 The Whitworth Art Gallery’s new exhibition Wallpaper includes four of Lucienne Day’s designs including Provence, which was launched at the Festival of Britain in 1951. 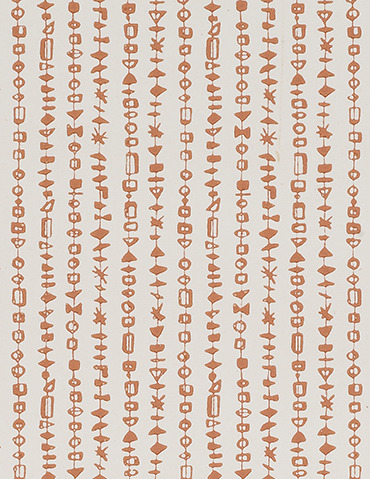 In the 1950s Lucienne Day designed wallpapers for a number of companies including Cole & Son, John Line, WPM (Crown) and the German firm Rasch. The exhibition runs till September 4th 2016. 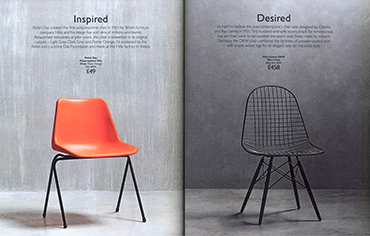 Robin Day’s Polypropylene Chair features opposite the Eames DKW Wire Chair in the John Lewis Spring/Summer 2016 Home Book. The Robin Day Polypropylene Side Chair and Armchair and the Robin Day 675 Chair are available at ten John Lewis Design Icons branches nationwide as well as online. 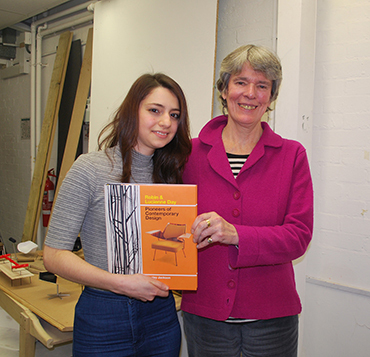 On December 15th 2015 the Foundation’s Chair Paula Day visited her father’s birthplace High Wycombe to join Foundation furniture technician Amos Marchant and Bucks New University tutors Fiona Davidson and Alex Hellum in viewing models made by BA Hons Furniture students for the first stage of the Robin Day Centenary Furniture Design Project. Paula presented a copy of Robin and Lucienne Day: Pioneers of Contemporary Design to Sabiha Macit as a prize for best design concept. The project will conclude in June 2016 when the students present full-size design prototypes. The Turner Prize 2015 was awarded to Architects’ collective Assemble. The announcement was made on December 7th at Glasgow Tramway. Assemble displayed items made at the Granby Workshop, Liverpool, a project set up as part of their collaboration with residents to regenerate the Granby area of the city. 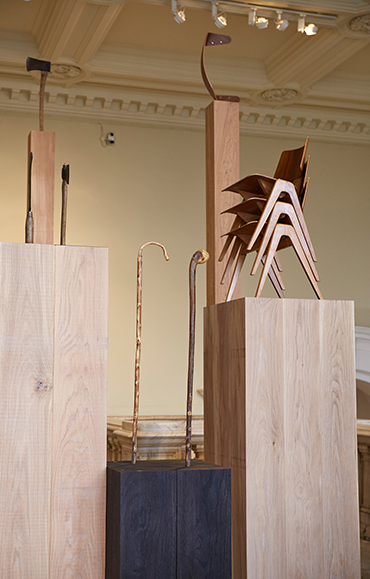 Assemble designed Robin Day Works in Wood, the exhibit shown at V&A during London Design Festival 2015 to celebrate Robin Day’s Centenary. The Foundation congratulates design retailer twentytwentyone on the company’s 20th anniversary. Twentytwentyone was set up by Simon Alderson and Tony Cunningham in 1996. 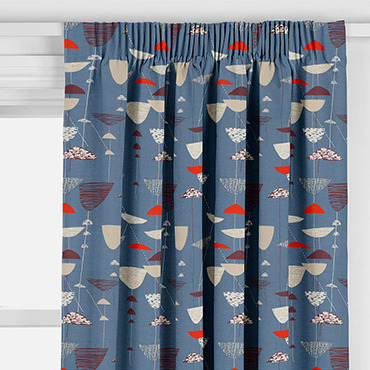 In the early years of the new millennium the company commissioned Robin Day to design the Avian range and reissued classics such as Lucienne Day’s tea towels. 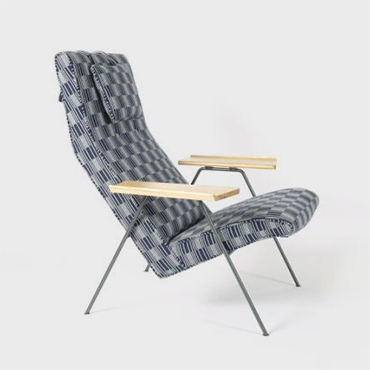 Twentytwentyone’s collaborations with the Foundation have included At Home with the Days online fundraising auction in 2014 and the Robin Day Reclining Chair Centenary Edition in 2015. The Foundation’s Twitter account provides daily information about events, exhibitions and publications featuring the work of Robin and Lucienne Day, design history including images from the Foundation’s digital archive, and current licensed productions of the Days’ designs. 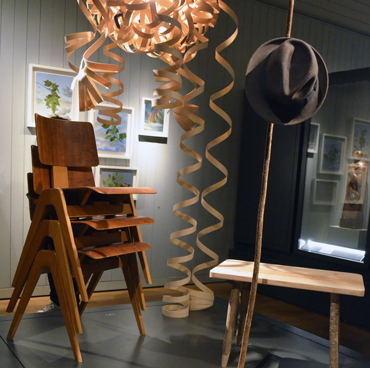 An LDF exhibition exploring Robin Day’s lifelong love for wood was shown at V&A from September 19th to October 4th. Robin Day Works in Wood was curated by Jane Withers and designed by Assemble, with graphics by Studio Gutiérrez. The timber plinths and table were fabricated by Benchmark. The exhibit was supported by the Foundation and by public money from Arts Council England, with further sponsorship from John Lewis and Benchmark. The Robin Day furniture on display was loaned by twentytwentyone, Amos Marchant, Michael and Anne Sydney, Case Furniture and Paula Day. The Foundation would like to thank all the sponsors and lenders. A Robin Day symposium was held at V&A on September 25th. Paula Day, Corinne Julius, John Simmons and Amos Marchant spoke. V&A archivist Christopher Marsden presented a selection of Robin Day’s posters and technical drawings. The audience included students from the furniture programme at Bucks New University, formerly High Wycombe Art School, where Robin Day studied in the early 1930s. 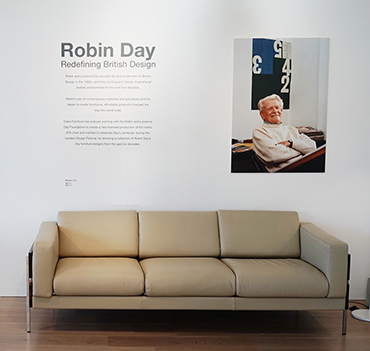 A Robin Day Retrospective was launched at Case Furniture’s new Wandsworth showroom on September 21st. 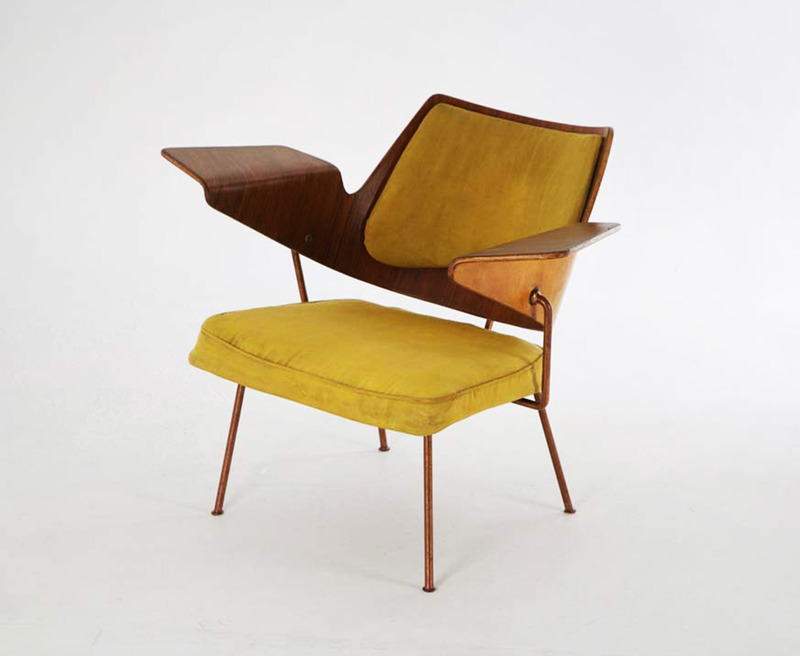 The original Robin Day pieces on show ranged from his 1951 chairs for the Royal Festival Hall to designs from the 2000s. Robin Day’s Polypropylene side chair and armchair for Hille are now available at all ten John Lewis branches with Design Icons departments nationwide. 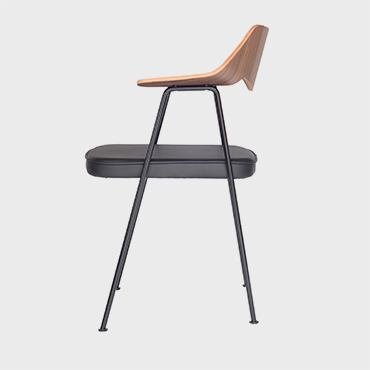 Case Furniture’s endorsed production of Robin Day’s 675 chair (1952) is now available at Heal’s Designer Brands on the second floor of the Tottenham Court Road store. The Centenary Edition of Robin Day’s Reclining chair (1952) with upholstery by ten of the country’s foremost designers is still available from design retailer twentytwentyone. 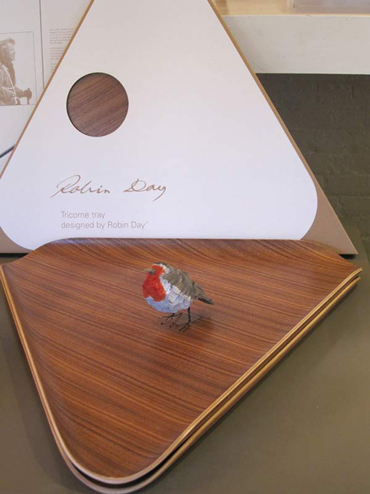 Robin Day’s Avian range (2000) and Tricorne tray are also manufactured by twentytwentyone, and his Sussex bench and table for Magis may be ordered through the company. The Foundation’s furniture technician Amos Marchant with tutors Fiona Davidson and Alex Hellum are running a Robin Day Centenary design project for furniture students at Bucks New University this November. 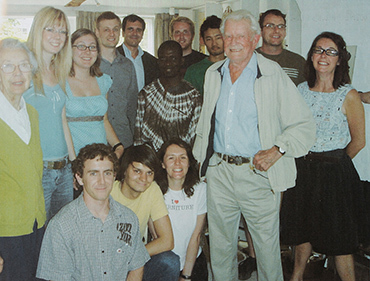 In 2006 Robin and Lucienne Day invited Bucks New University furniture students and tutors to their home in Chichester. Photo by Tony Smart. The work of architect Peter Moro is the subject of a conference organised by the Twentieth Century Society to be held at the University of Westminster, London on November 14th. 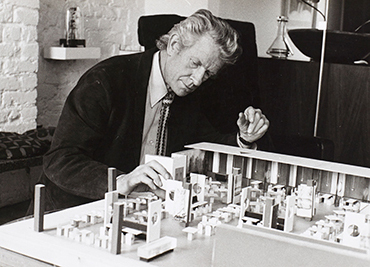 Peter Moro invited Robin Day to work with him on exhibition designs in the late 1940s, and brought him in to design all the furniture for his Royal Festival Hall interiors. Later collaborations included Nottingham Theatre and the Hille showroom in Albemarle Street. The Foundation can now be followed on Twitter @Robin_Lucienne. 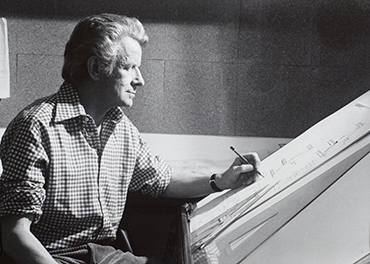 Robin Day’s centenary will be celebrated with exhibitions and events across the capital during London Design Festival (September 19th - 27th). A free ‘Day in London’ fold-out map is available by post from the Foundation. A ‘forest’ installation by Turner Prize nominees Assemble puts Robin Day’s work into a new perspective. The exhibit, curated by Jane Withers, juxtaposes his furniture designs with personal objects he made by hand out of the material he loved best – wood. Speakers at this symposium include design journalist Corinne Julius, Robin Day’s daughter Paula Day, and Robin Day’s draughtsman John Simmons in conversation with the Foundation’s furniture technician Amos Marchant. 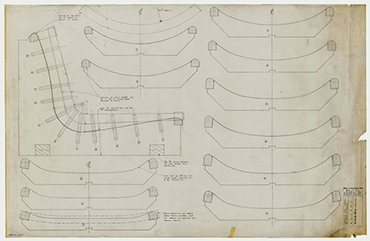 Technical drawings from the V&A archive will be on view. During London Design Festival the Robin Day centenary poster will be in stock at the V&A shop, Case Furniture and twentytwentyone. It is also available online from twentytwentyone. Ten of the country’s foremost designers collaborate with twentytwentyone to pay tribute to Robin’s classic Reclining chair (1952) by selecting contemporary upholstery. First launched on June 30th, the Centenary Edition is now on display at twentytwentyone’s shop and showroom. 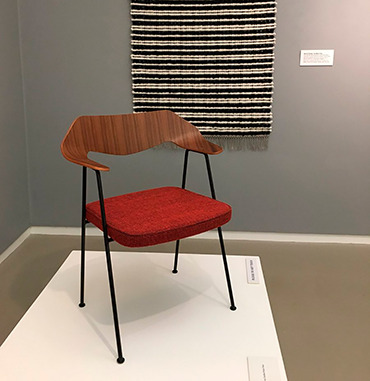 A retrospective showing original Robin Day pieces on loan from private collectors across the country, including chairs designed for the opening of the Royal Festival Hall in 1951, and the closely related 675 chair (1952). 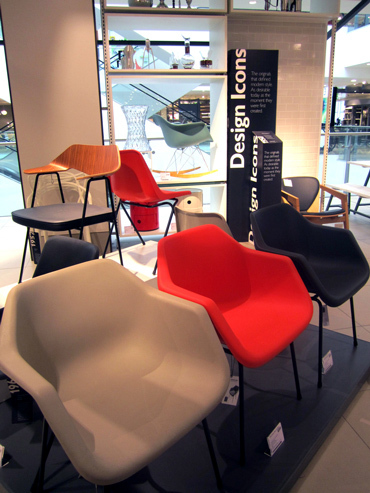 Robin Day’s most famous designs, the Polypropylene side chair (1963) and armchair (1967), re-launch alongside his classic 675 dining chair in a special Robin Day display on the new Home Floors at John Lewis Oxford Street. 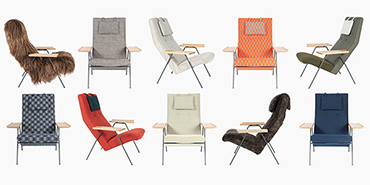 All the chairs are available to order online and will be ranged at ten John Lewis Design Icons departments across the country by the end of September. Robin and Lucienne Day worked as Design Consultants to John Lewis from 1962 – 1987, overseeing a transformation of all aspects of the company’s house style. The Foundation is delighted to announce a new collaboration with Hille Educational Products. Robin Day designed the Hille logo in 1949 at the start of his long and close relationship with the Hille family firm. 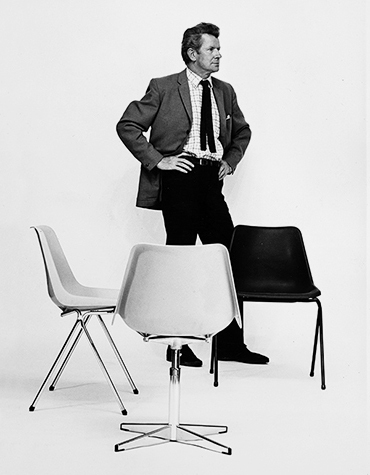 Over the next three decades his prolific and innovative output for the company, including the ground-breaking Polypropylene chair (1963), put modern British furniture design on the world map. Hille Educational Products was incorporated in 2008 when the company was acquired by Brian Foster, who had been responsible for manufacturing much of Hille’s plastic seating from the 1970s onwards. The company has worked closely with the Foundation to re-launch the Polyside and Armchair in Robin’s distinguished grey, charcoal and flame colours, and with Robin’s elegant P5 side chair stacking frame. These British design classics are now made by a skilled and dedicated workforce at the Hille factory in Ebbw Vale, South Wales. 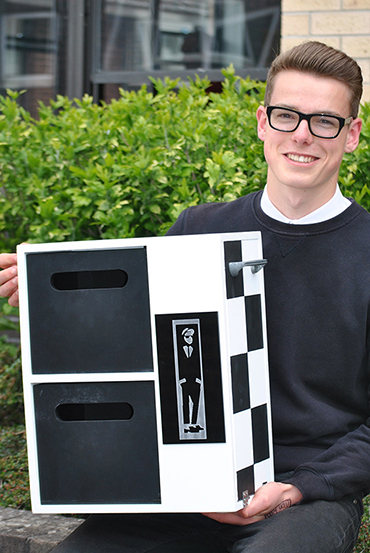 One hundred schools have been presented with copies of Modern British Furniture: Design since 1945 to award to their best GCSE Design and Technology students. The Robin Day Furniture Design Awards scheme was set up in association with the Furniture Makers’ Company. 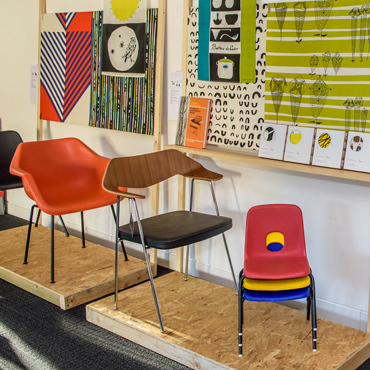 Johnny Westbrooke, Chief Executive of the Furniture Makers’ Company said: “We were honoured that the Robin and Lucienne Day Foundation chose to mark what would have been renowned furniture designer Robin Day’s 100th birthday with 100 prizes for school children." Prize-winners included Zac Hebditch, aged 16, The Castle School, Taunton. 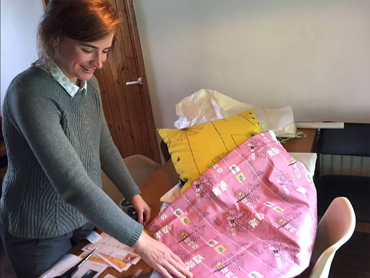 The Robin and Lucienne Day Prize for Ethical and Sustainable Design 2015 was awarded to Lucy Rainbow, a second-year Printed Textiles student at the Royal College of Art, London. The winner was jointly chosen by the Rector of the RCA and the Chair of the Foundation. Lucy Rainbow showed prints for nurses’ uniforms on sustainable fabrics such as hemp, designed to bring life-enhancing contact with nature to hospital patients and staff. She said:"I am beyond grateful to The Robin and Lucienne Day Foundation for their support and encouragement, which has served to strengthen my resolve to continue with my design project." 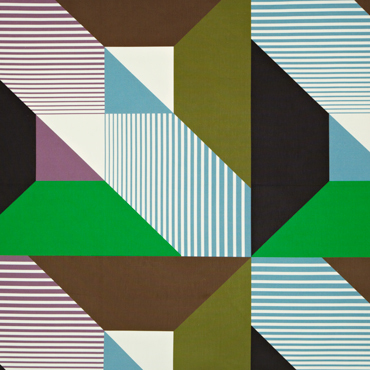 Lucy Rainbow follows in the footsteps of Lucienne Day, who put on her Diploma Show in Printed Textiles at RCA in 1940. 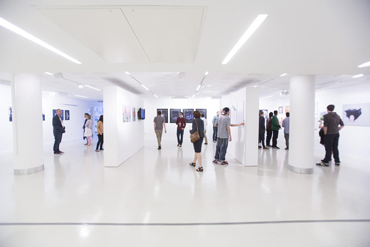 The Foundation held its official launch at the Royal College of Art on May 6th. 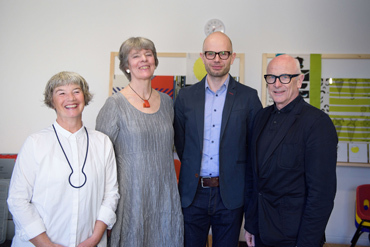 Dr. Paul Thompson (RCA Rector), Jeremy Myerson (Helen Hamlyn Professor of Design) and Paula Day (Foundation Chair) spoke to an invited audience of over a hundred people including Robin and Lucienne’s family, friends, staff and fellow RDIs. The design industry, design education, design museums and archives were represented. The Foundation’s Licensees, professional advisers, Trustees and Patrons all attended the event, which was organised by Mary Mullin, one of the Trustees. A drinks reception was held in the Senior Common Room. 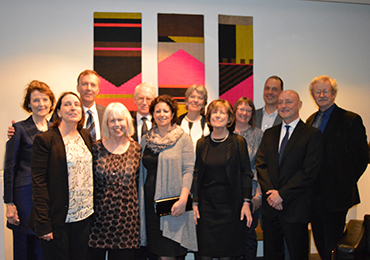 The Foundation's Patrons, Trustees and professional advisers were photographed with the Rector in front of the silk mosaic given to the College by Lucienne Day. 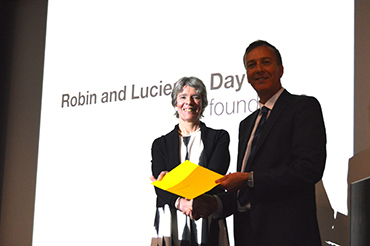 The Robin and Lucienne Day Prize for Ethical and Sustainable Design 2015 will be awarded to the Royal College of Art final year student who, in the judgement of the Rector and the Chair of the Foundation, has realised the design which best embodies Robin and Lucienne Day’s commitment to socially responsible and sustainable design. 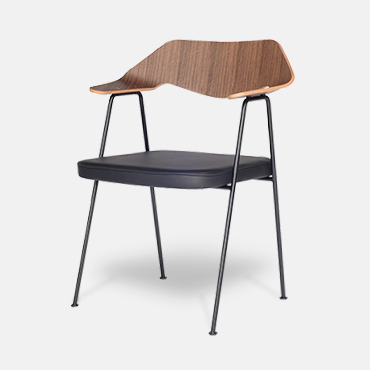 To celebrate Robin’s centenary, the Foundation is collaborating with the Furniture Makers’ Company to give 100 state schools a Robin Day Furniture Design Award certificate and a copy of Modern British Furniture to present to their best GCSE Design and Technology student. 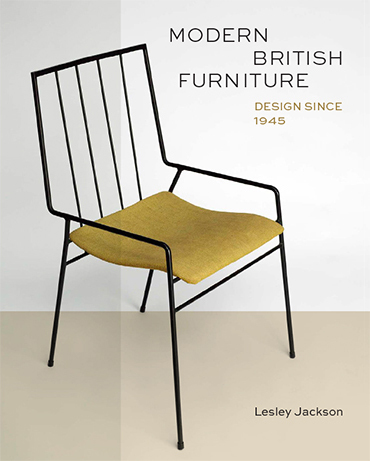 Modern British Furniture: Design since 1945 by Lesley Jackson (V&A Publishing) includes two chapters on Robin Day and Hille. Guests at the Launch were presented with a copy of Robin Day 100 Designs. The poster, designed by Studio Fernando Gutierrez and featuring design images and portraits from the Foundation’s archive, is now available from twentytwentyone and other selected outlets. 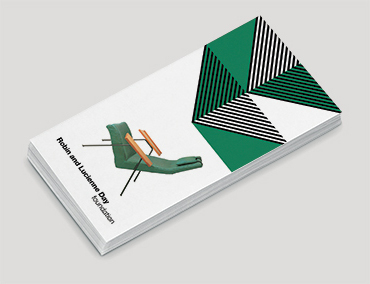 A year after launching its website, the Foundation has produced a leaflet displaying design images and portraits alongside a brief account of the careers of Robin and Lucienne Day and the work of the Foundation. 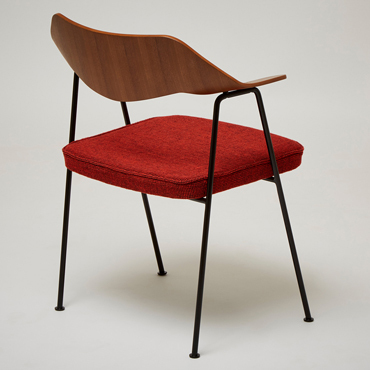 More than sixty years after it was designed, Robin Day’s 675 chair (1952), now available in Case Furniture’s licensed and endorsed new production, has been awarded a Design Guild Mark by the Furniture Makers’ Company. 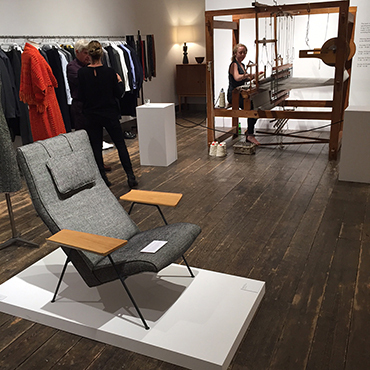 The Mark, announced at the Farmiloe Building, Clerkenwell, London on May 19th, was awarded ‘for excellence in design in the British Furniture Industry 2015’. 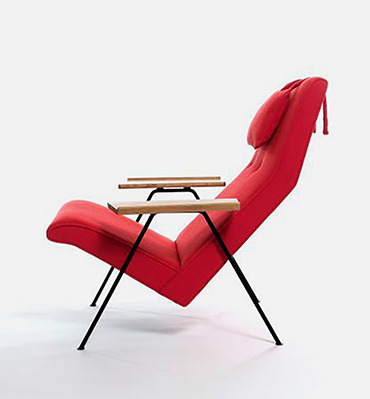 Design retailer twentytwentyone is celebrating Robin Day’s centenary with a special edition of Robin’s Reclining chair (1952). Ten of the country’s foremost designers including Margaret Howell CBE and Sir Kenneth Grange have paid tribute by selecting contemporary upholstery fabrics to complement the historic design. The edition will be launched at twentytwentyone's showroom and available to order from July 1st. 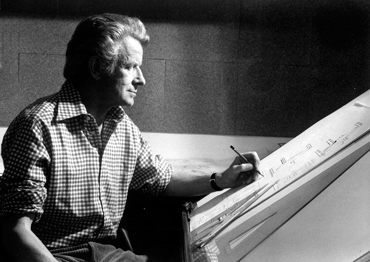 The London Design Festival 2015 will celebrate Robin Day’s centenary with a ‘Day in London’ cultural trail. The trail will link a major LDF exhibit at the V&A Museum with displays at the Royal Festival Hall and the Design Museum to highlight different aspects of Robin’s work. The London Design Festival, the country's biggest annual design event, will run from September 19th - 27th. As well as the LDF’s major exhibits at the V&A, the programme includes hundreds of shows put on by partner organisations across London. The London Design Festival’s Robin Day Centenary exhibit will be on view at the V&A, the world’s greatest museum of decorative art and design, from September 19th onwards. The installation, curated by Jane Withers and designed by Assemble, will explore Robin’s lifelong love of wood. The Royal Festival Hall will celebrate Robin Day’s centenary with an exhibit about Robin’s seating for the building, which opened for the Festival of Britain in 1951. Robin designed all the original furniture, from the orchestra, dining and lounge chairs to the auditorium seating, which is still in use today. 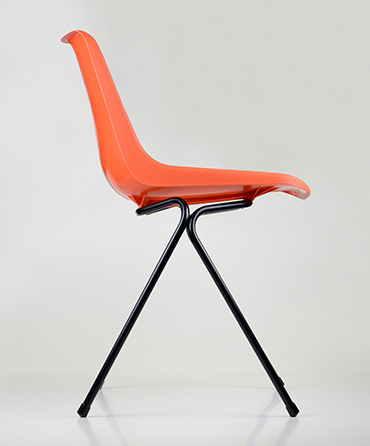 The Design Museum will celebrate Robin Day’s centenary with a display of items from his studio which illustrate his working practise, with particular reference to the Polypropylene chair (1963). 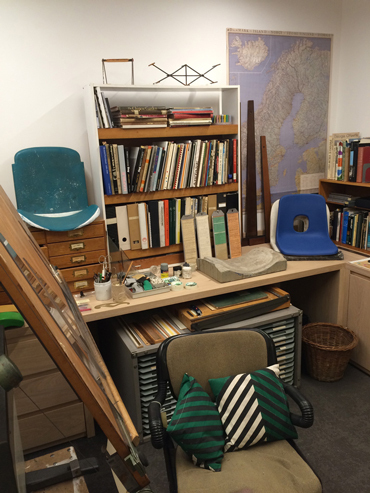 In 2013 the Foundation donated the entire contents of Robin’s last studio to the Design Museum. 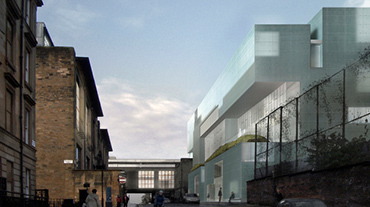 The Foundation's official Launch will take place in May at the Royal College of Art, London. Robin and Lucienne, who both studied at the RCA, first met at a College dance in spring 1940. The Launch is timed to honour the centenary of Robin Day's birth. Robin was born in High Wycombe in May 1915, a hundred years ago this year. Caro Communications will be supporting the Foundation’s launch and Robin Day centenary celebrations this year. Caro specialises in PR for architects and designers. The Foundation’s collection of historic Robin Day design photographs has been accessioned and catalogued by archivist Wilhelmina Baldwin and photographed at the Foundation’s office by Gwen Riley-Jones of the Centre for Heritage Imaging and Collection Care, The University of Manchester Library. Over 1,300 Robin Day design images and over 250 portrait photographs of the Days have so far been digitised. The Foundation is producing a unique celebratory poster for Robin Day’s centenary. The poster, designed by Fernando Gutiérrez, will feature design images and portraits from the Foundation’s Robin Day Photograph Archive. Fernando Gutiérrez, who looks after all the Foundation’s graphics, has been appointed Royal Designer for Industry (RDI). The RDI is the UK’s highest professional accolade for designers across all disciplines. Fernando was one of only four new RDIs appointed in 2014. 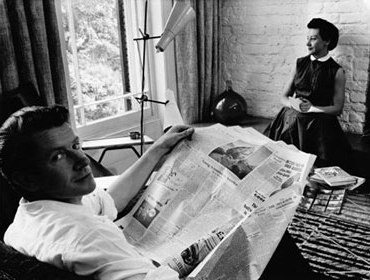 Robin and Lucienne Day were the first married couple both to hold the title (Robin was appointed in 1959 and Lucienne in 1962). In 1987 Lucienne became the first woman Master of the Faculty of RDIs. 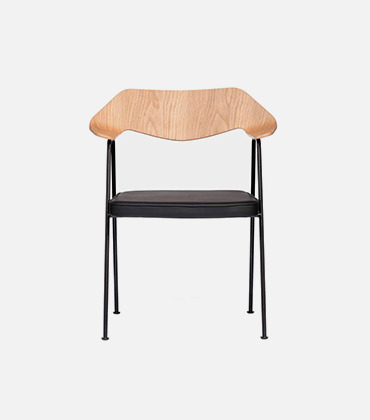 Case Furniture’s authentic new production of Robin Day’s 675 chair is now available in an exclusive version with oak finish arms and black frame from The Home, Salts Mill. The Home, an independent retailer specialising in licensed furniture design classics, is situated in the same building as the David Hockney gallery, a converted mill in the UNESCO World Heritage site of Saltaire, West Yorkshire. The six dress fabrics designed in 1954 by Lucienne Day for John Lewis company Cavendish are still available in the Haberdashery departments of some John Lewis stores. The six designs, available in multiple original colourways, are all printed on 100% cotton. The reality of ‘art for the people’, dreamed about by the Victorian William Morris, was finally achieved by a female designer in the middle of the 20th century. (The Guardian, February 3rd 2010). 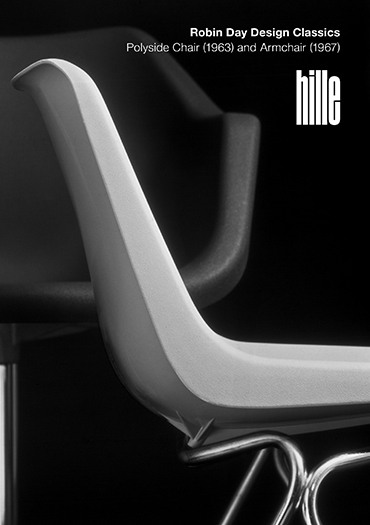 Case Furniture has launched an endorsed new production of the classic 675 dining chair, designed by Robin Day in 1952. An example of the original production was the basis for development work carried out in consultation with the Foundation and with close attention to authentic detailing. 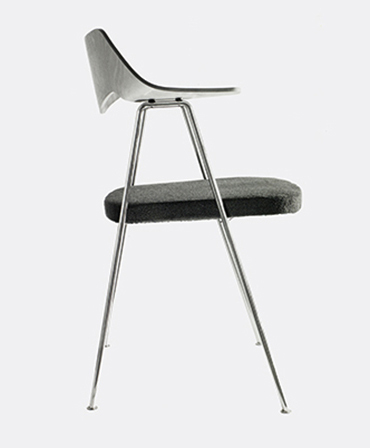 The 675 Chair is available from John Lewis or direct from Case. Paula Day spoke about the Foundation’s work to protect her parents’ design legacies at a London Design Festival event held at the V&A on September 16th. 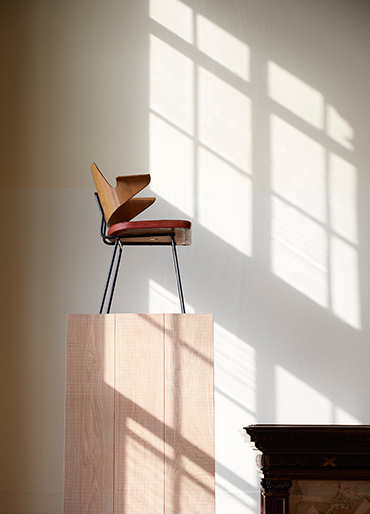 Design historian Charlotte Fiell drew the wider picture and Paul Newman of Case Furniture described his company’s collaboration with the Foundation on their new production of Robin’s 675 Chair. Dezeen online magazine carried a follow-up interview with Paula Day. 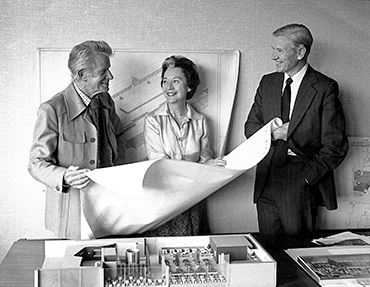 The Foundation has now developed Robin Day and Lucienne Day Endorsement Policies. These set out the Foundation’s criteria for Endorsement of products as high-quality authentic productions of original Robin or Lucienne Day designs. The Endorsement Policies are available to view on request from the Foundation. The Foundation has appointed industrial designer Amos Marchant as Furniture Technician. Amos, who worked with twentytwentyone on Robin Day’s Avian range, will be responsible for examining and recommending new productions of Robin’s designs to the Trustees for Endorsement. The At Home with the Days online auction of items from the Days’ homes raised over £33,000. The auction was generously curated and hosted by design retailer twentytwentyone. All proceeds will help to fund the Foundation’s educational work, specifically the creation of a Robin and Lucienne Day digital archive. The Foundation has appointed website designer and archivist Wilhelmina Baldwin to digitise the Robin and Lucienne Day photographic archive. The archive will be a unique educational resource and facilitate the supply of images to design journalists, writers, and curators. 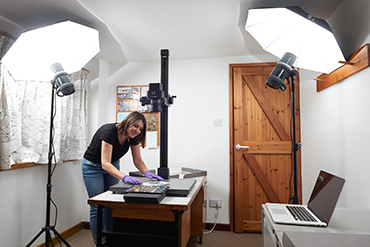 The Foundation’s photographic archive will be supported by input from design historian Lesley Jackson. 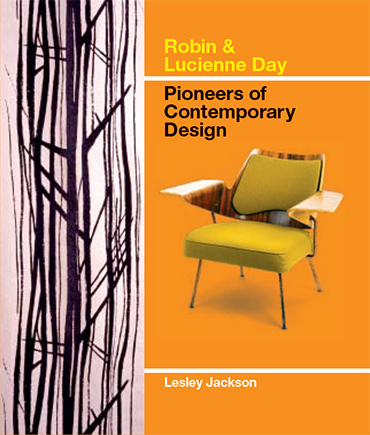 Lesley’s book Robin and Lucienne Day: Pioneers of Contemporary Design (Mitchell Beazley, new edition 2011) is the definitive work on the Days’ design careers. 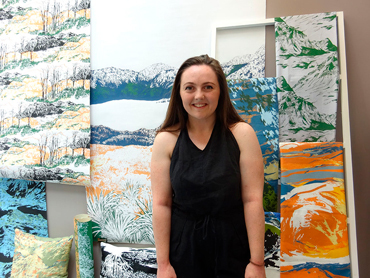 This year’s Textile Society Lucienne Day Award has been presented to Rachel Howarth, a graduate of Heriot-Watt University’s Design for Textiles BA. 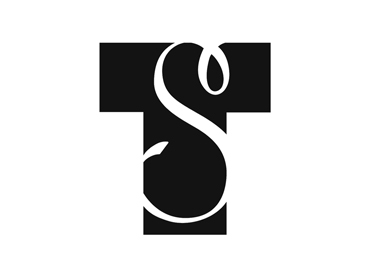 The Textile Society is an educational charity which promotes the study of textile disciplines and celebrates the history and culture of textiles, both traditional and contemporary. 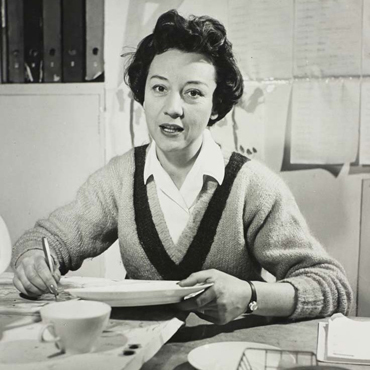 Lucienne Day was the Society’s first Honorary President, a position she held from 1992 – 2002. With the growing interest in Lucienne’s work, it is essential that the Foundation can ensure that her name is used worldwide to sell only products made to her actual designs. LUCIENNE DAY is now a registered international trademark across ten product categories. Design retailer twentytwentyone is hosting an exhibition and online auction of items from the Days’ own homes, including china and silk mosaics by Lucienne, and one-off furniture and prototypes by Robin. This is a unique opportunity to learn more about the Days’ home lives and acquire pieces with special provenance. Twentytwentyone has worked closely with the Foundation for over a year on the conception and development of the sale. The company has generously undertaken to curate, photograph and catalogue the objects, as well as hosting the exhibition and managing the online auction. 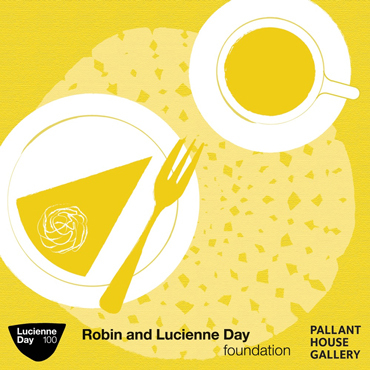 All proceeds will benefit the Foundation, helping to fund the creation of a Robin and Lucienne Day digital archive. The Days’ Chichester house is featured in Leslie Williamson’s new book about the homes of celebrated 20th century European designers. Twenty-two photographs of the interiors accompany an account of Leslie’s visit to the house. 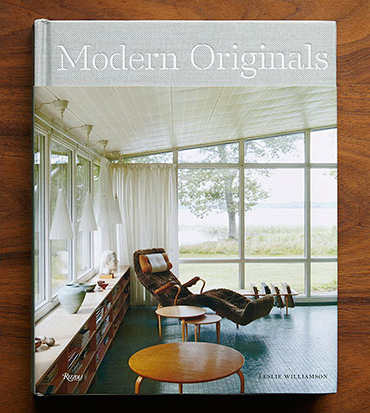 The homes of Le Corbusier, Finn Juhl and Alvar Aalto are among those covered in other chapters. Leslie Williamson is a San Francisco-based photographer best known for her interior portraiture. Robin Day’s own drawing board and implements will be on show at the Design Museum as part of an exhibition devised to illustrate the design process. 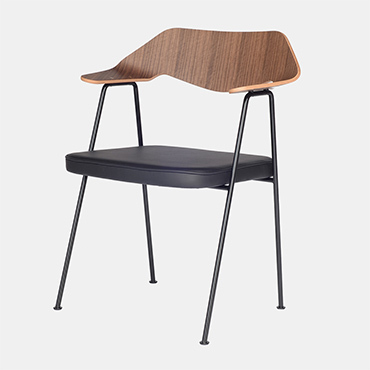 The display, focused particularly on Robin’s ground-breaking 1963 Polypropylene Chair, will be accompanied by recordings of Robin’s daughter Paula and his draughtsman John Simmons talking about how he worked. In 2013 the Foundation donated the entire contents of Robin’s studio to the Design Museum (with the exception of his technical drawings which are archived at the V&A). 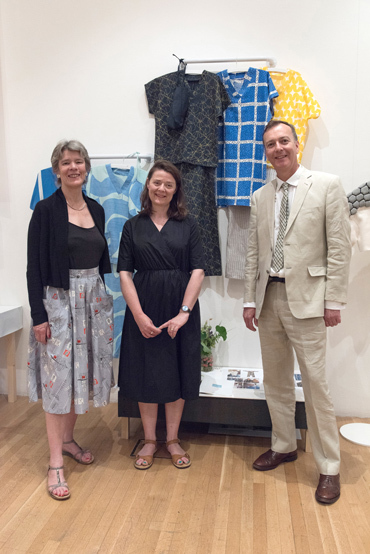 The John Lewis 150 Years fashion range made from Lucienne’s 1954 dress fabric designs has been described by Andy Street, John Lewis Managing Director, as ‘a triumph’. He went on to say: The collaboration with the Day Foundation has played a key part in making this celebratory year a success. The fashions, launched in May, sold out within a few weeks. The six dress fabrics will continue to be available from John Lewis haberdashery departments nationwide. John Lewis is now bringing out a range of cushions using furnishing fabrics (Halloween, Panama and Lucienne) designed by Lucienne for the company in the 1970s. 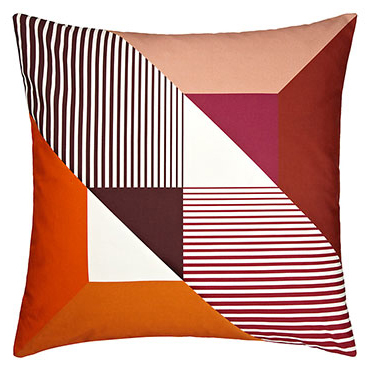 The new Lucienne Day cushions will feature in an exhibition held at the Design Museum to mark John Lewis’ 150th anniversary. John Lewis will be taking part in Design Junction for the first time this year, with a stand featuring the new Lucienne Day cushion range. 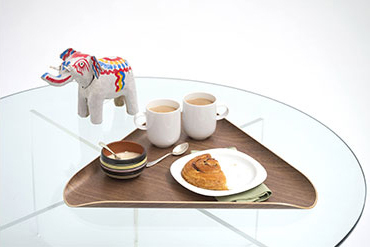 Twentytwentyone relaunched the Robin Day Tricorne tray in June 2014. The plywood tray (named after the three-cornered ‘tricorne’ hat), was designed in 1955 as a small cocktail tray. In 2006 Robin collaborated with twentytwentyone on a scaled-up version. This product has now been re-launched, and is shown below on the Days’ own coffee table (Lot 2 in ‘At Home with the Days’ selling exhibition and online auction). The new website, designed by Studio Fernando Gutiérrez, presents a visual timeline of Robin and Lucienne’s work, with design history by Lesley Jackson. It provides the definitive online resource for accurate information about Robin and Lucienne Day’s lives and design careers, as well as news about the Foundation and its licensees. 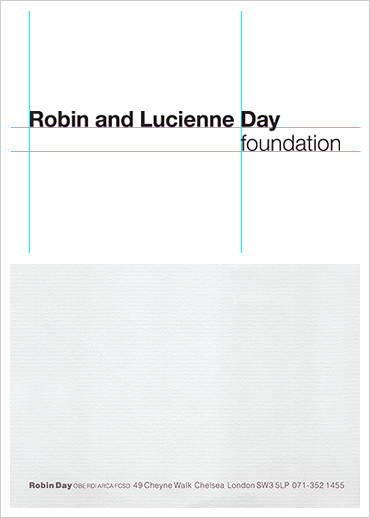 The Foundation’s Logo, designed by Studio Fernando Gutiérrez, is closely based on Robin and Lucienne’s own letterheads. Robin and Lucienne’s contribution to John Lewis as Design Consultants from 1962–1987 is being celebrated as part of the company’s 150 Years, launched on May 1st. All John Lewis staff are receiving a copy of A Very British Revolution: 150 Years of John Lewis, which includes a chapter on the Days. 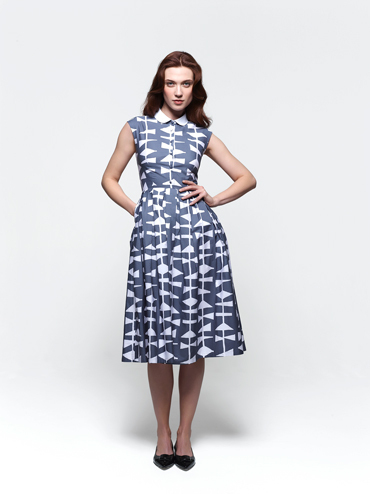 John Lewis is launching a Lucienne Day fashion range. The fashion, inspired by garments from Lucienne’s own personal wardrobe, is made up in new productions of two of her 1954 dress fabric designs for John Lewis firm Cavendish Textiles. A wider choice of Lucienne’s Cavendish dress fabrics in multiple colourways is also available. 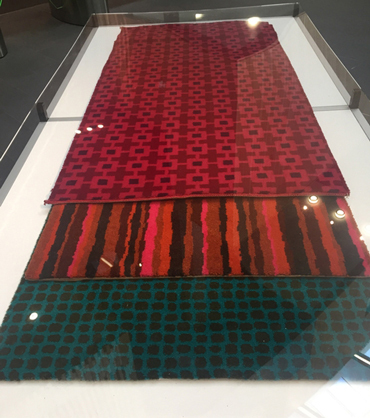 Three of the furnishing fabrics she designed for Cavendish in the 1970s, including a striking geometric pattern simply called ‘Lucienne’, may be purchased by the length. The range is based on scrupulously careful research carried out in the John Lewis textile archives and the Whitworth Art Gallery by Emma Christmas, who co-ordinated the John Lewis design teams’ development work in close consultation with the Foundation. 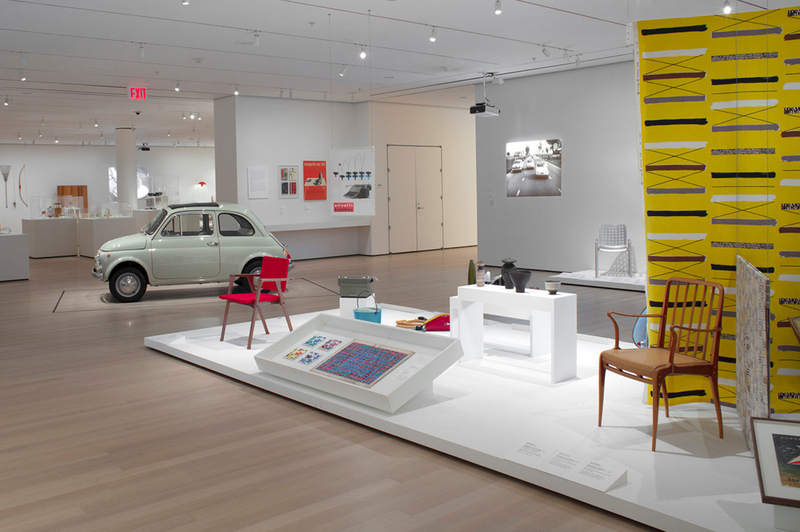 A special screening of Design Onscreen’s documentary film Contemporary Days: The Designs of Lucienne and Robin Day was held on April 29th at The New York Museum of Modern Art, at the request of MOMA’s Curator of Historical Design. The film offers a vivid and thoughtful account of the Days’ design careers. Design Onscreen is a Denver-based non-profit foundation dedicated to producing high-quality films on architecture and design. Lucienne Day: In the Spirit of the Age by Andrew Casey was published by Antique Collectors’ Club Editions. The book, with a foreword by Paula Day, is lavishly illustrated with portrait photographs from the Foundation’s own archive, and full-page images of Lucienne’s work in multiple colourways. Registration of ROBIN DAY trademark in U.S.
With the growing international interest in Robin and Lucienne Day’s work, it is essential that the Foundation can ensure that their famous names are used worldwide only with products made to their actual designs. This newly registered ROBIN DAY trademark extends protection to the United States. Classic Textiles has moved to new premises. 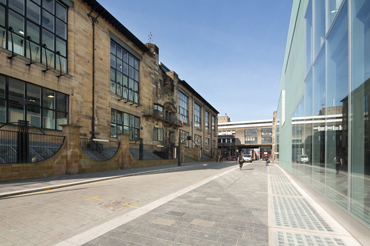 The twelve Lucienne Day textile designs will now be printed in the Reid building, immediately opposite Charles Rennie Mackintosh’s world famous Glasgow School of Art. 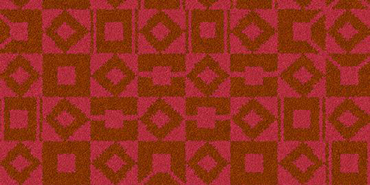 Classic Textiles was set up by the Centre for Advanced Textiles, a research, education and commercial department within Glasgow School of Art, to pioneer high-quality digital productions of great 20th century textile designs. The Classic Textiles 2003 Lucienne Day range of furnishing fabrics is unique as it was developed in consultation with Lucienne herself. New state-of-the-art digital equipment has been installed in the printworks, which will allow for a much increased volume of production. 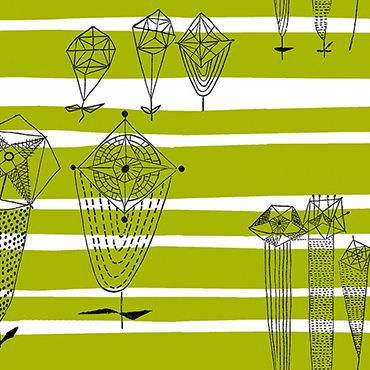 Twentytwentyone has added another design to their licensed range of Lucienne Day tea towels. Black Leaf (1959) won a Design Centre Award in 1960. The new twentytwentyone production is available in Lucienne’s yellow colourway, and, like the Thomas Somerset original, it is printed on 100% Irish linen. An auction of those Robin Day furniture pieces and Lucienne Day silk mosaics which could not be accommodated by public collections was held at Christie's, St James, London on October 30th. Several items (including two Forum sofas, designed by Robin Day for Hille in 1964), beautifully displayed in the sale rooms alongside other highly valued works of international 20th century decorative art and design, achieved purchase bids well above the guide prices. Robin and Lucienne Day’s last home, an historic town house just opposite Chichester cathedral, was sold to benefit the Foundation. Furniture and furnishings used in the Days’ home and records from their office and studio were donated to a number of museums and educational institutions. Photographs from World of Interiors June 2011 by Antony Crolla © World of Interiors.